The recent meeting of the Mercia Lodge MMM no. 1240 was the occasion for the latest 'Provincial Team meeting' under the direction of our new Provincial Grand Master, R.W. Bro. Stephen Hallberg with some 56 Brethren attending and enjoying another happy and memorable evening of Mark Masonry with the PGM being accompanied by his Deputy PGM and Assistant PGM and escorted by a delegation of his Provincial Officers. Under the leadership of the Worshipful Master, W. Bro. 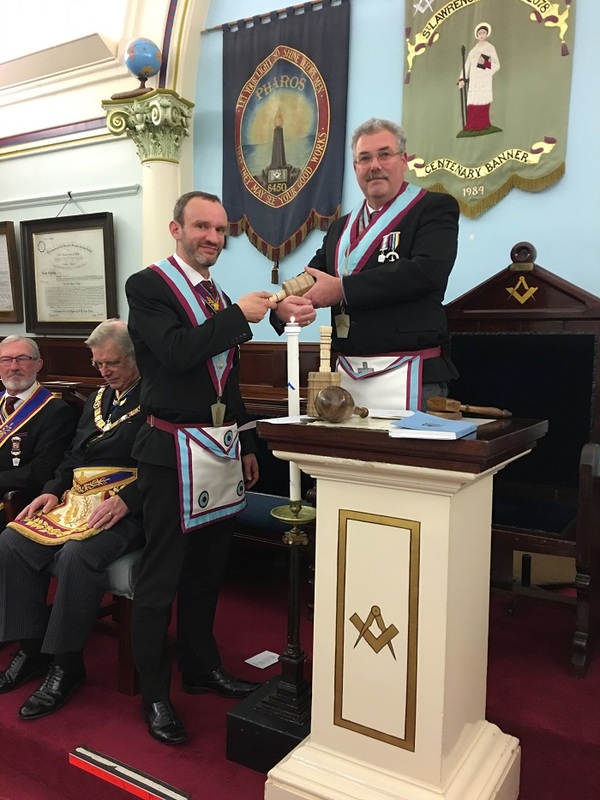 David Dorey, an excellent ceremony of Advancement was carried out by the Officers of the Lodge with Bro. 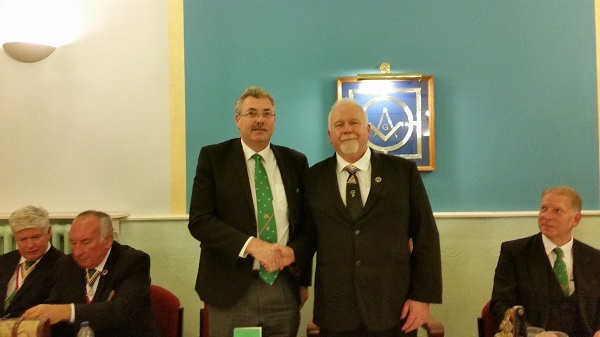 Scott Laird being welcomed into the Mercia Lodge as the latest member of the Mark degree in our Province. The evening was also further enhanced by the presentation of a 60th year certificate to W. Bro. Bryan Robinson, MBE, by the Provincial Grand Master (yes, you read it right - a 60th). W. Bro. Bryan was initially advanced into the Mark degree on the 24th March 1959 in Urania Lodge no. 326 at Louth which then allowed him to set up and become a founder member of Mercia Lodge in his home town of Spalding on the 18th November 1959. Typical of Brian was that he used to travel to Louth on his motorbike, padded out with newspaper to keep out the cold - dedication ! The Provincial Grand Master paid tribute to this remarkable Mark Mason, praising his unstinting diligence and commitment, not only to Freemasonry but also to his service to the local community for which he was honoured by being awarded the MBE in 2016 - quite simply an example to each and every one of us and we wish both Brian and Scott many more good years of health and happiness as Mark Masons. W. Bro. Arthur Baxter to Past Grand Junior Deacon. 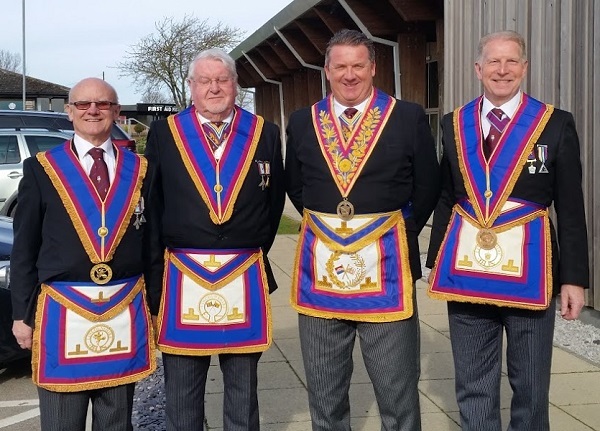 The promotions have all been made for their unstinting continued hard work and commitment to the Mark Degree in Lincolnshire and it is hoped that many Brethren will take the opportunity to attend one or both of these meetings to support them. on Friday 17th May at THE MASONIC HALL, CAMBRIDGE ROAD, GRIMSBY, DN34 SZ. All Royal Ark Mariners, regardless of rank are able to attend the Assembly and it is hoped that the Provincial Grand Master and the appointees will receive the support of the Royal Ark Mariners of Lincolnshire on this special occasion. All Mark Master Masons may attend, and those who have never been to Grand Lodge are particularly encouraged to attend this splendid occasion which has traditionally been arranged to celebrate those receiving their first Grand Rank appointments at a festive board in Baldock. The cost depends on numbers travelling on the coach; with a full 29-seater coach this would be approx. £54; this includes travel, bacon buttie/coffee or tea on outward journey and a 3-course evening meal on the return journey (excluding drinks). SKEGNESS ROYAL ARK MARINERS PUSH THE BOAT OUT! 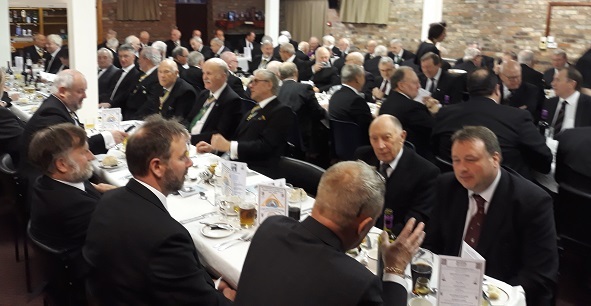 The Installation meeting of The Earl of Scarbrough Lodge No1032 of Royal Ark Mariners (RAM), was held on 27 March 2019, at the Skegness Masonic Centre. 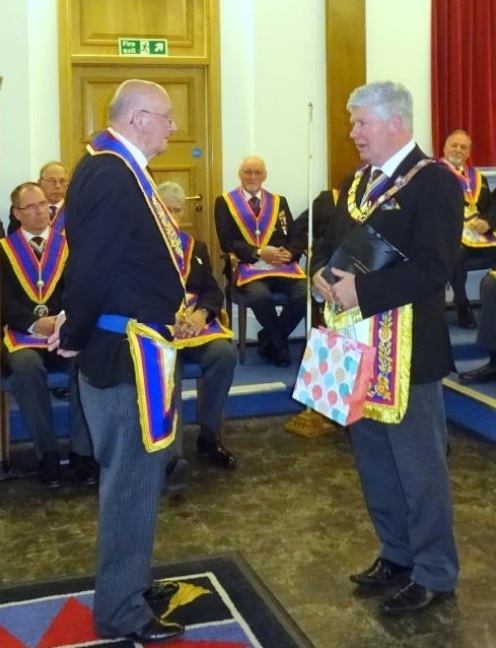 The Lodge was honoured by the presence of R.W.Bro. 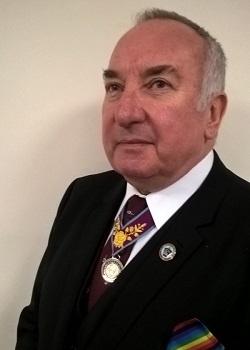 Gordon Walkerley-Smith as the personal representative of the PGM (R.W.Bro Stephen Hallberg). After a very successful meeting all RAM brethren joined their partners and retired to the ‘White Table’ festivities, which had been opened up to all Mark Master Masons and their partners with a view to giving them a greater understanding of the Order with the hope that they may make further enquiries and ultimately make an approach to join. 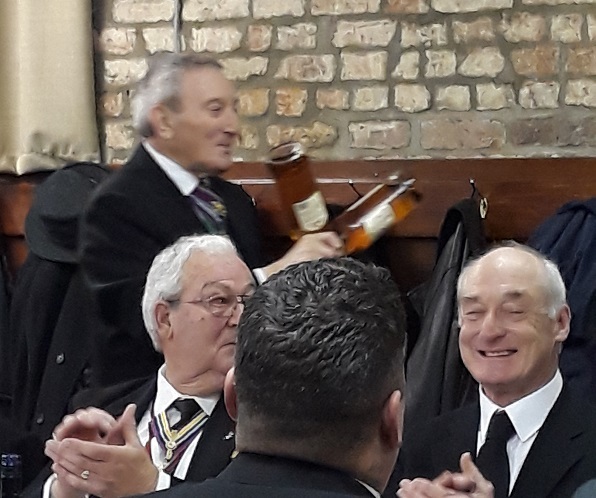 Subsequently at the very convivial Festive Board, of some 74 diners, a raffle was organised to raise funds for the local RNLI, which was very well supported. The newly installed Worshipful Commander (W.Bro Norman Rollitt) was pleased to present W.Bro Alan Fisher, in his capacity as Skegness Lifeboat Operations Manager, with the proceeds of the raffle some £275. 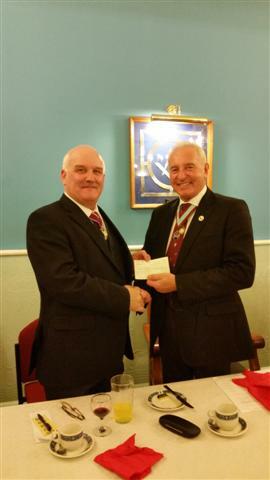 W.Bro Norman Rollitt (Right) presenting W.Bro Alan Fisher with the proceeds of the raffle. Any MMM interested in this most rewarding degree can find more information at: http://www.markmmlincs.org.uk/?Royal-Ark-Mariners. 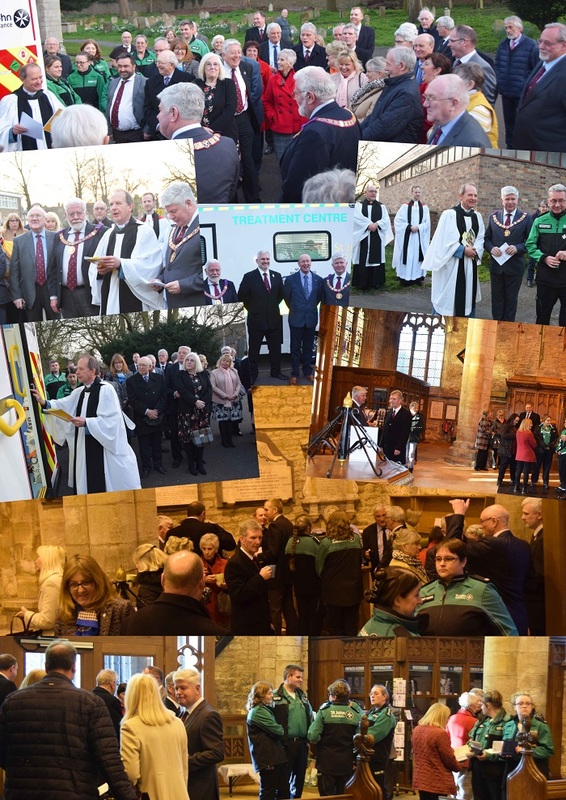 Sunday the 31st March proved to be yet another day to remember for the Mark Masonic Province of Lincolnshire with the official handover and blessing of the Treatment centre vehicle which has been donated by the Mark Benevolent Fund for use by the volunteers of the St. John Ambulance in Lincolnshire who provide such a valuable community service to the people of the County. The handover took place at the Parish church of St. Mary and St. Nicholas in Spalding following a delightful service of Evensong and was attended by our Provincial Grand Master, R.W. Bro. 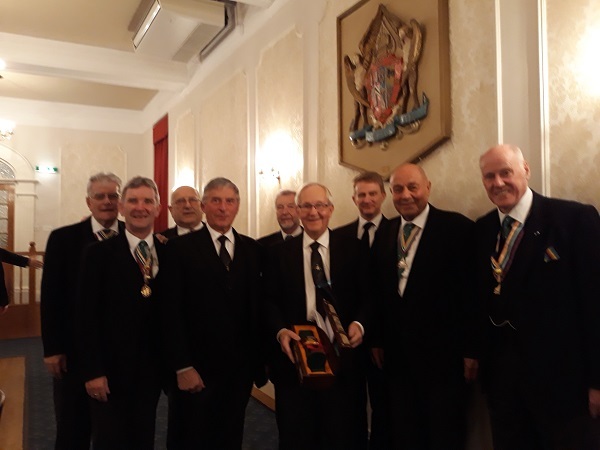 Stephen Hallberg and his Assistant, W. Bro Jack Geehoed, along with a sizable contingent of Mark Master Masons and their wives, many of whom had travelled long distances to witness and share the occasion with Grand Lodge being represented by W. Bro. Dan Heath, one of our Assistant Grand Secretaries. 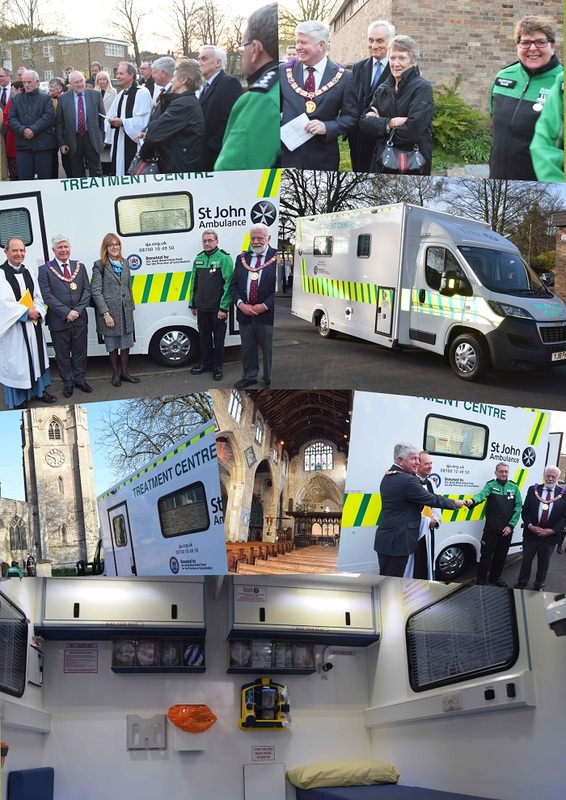 The Blessing of the vehicle was undertaken by the County Chaplain of the St John Ambulance following which our Provincial Grand Master ceremonially handed over the keys to the head of the Spalding St John Ambulance unit. The treatment centre is one of 52 which have been donated by the MBF for use across the country, a donation of which the Mark Masons of Lincolnshire can be justly proud, having contributed to the fund so generously during our 2018 Festival. 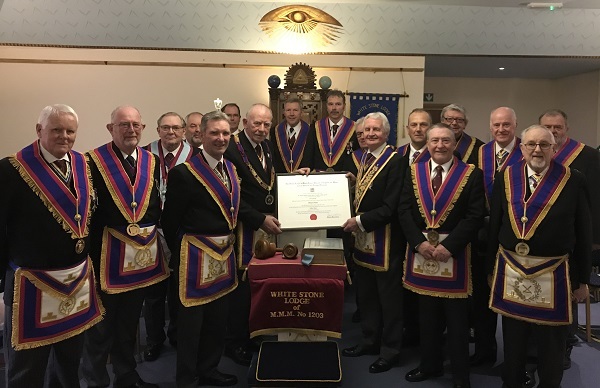 On Thursday 28th March 2019, The St. Wulfram’s Lodge of Mark Master Masons 916 in Grantham was honoured by the visit of the Right Worshipful Provincial Grand Master, the Worshipful Deputy Provincial Grand Master, the Worshipful Assistant Provincial Grand Master, other distinguished brethren and most of the Provincial team on their first Provincial visit following the recent installation of Right Worshipful Brother Steve Hallberg as PGM. The visiting Provincial team witnessed the Installation of Bro. Steve Heath into the Master’s chair, which was undertaken with great proficiency and sincerity by the Installing Master, W. Bro. Peter Chandler. During the Lodge meeting, the Right Worshipful Provincial Grand Master kindly agreed to make a presentation, on behalf of the Lodge, to the retiring Secretary, W. Bro. David Burnett, to thank him for 18 years of service to the Lodge in that role. 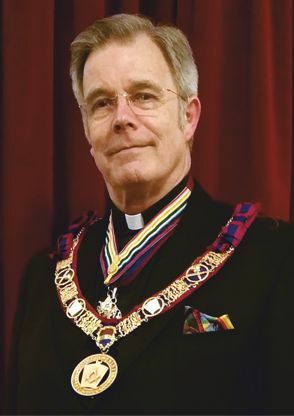 Earlier in the meeting, the Right Worshipful Provincial Grand Master had informed the brethren that the date of the meeting was very meaningful to him and the Lodge as it was 12 years earlier, on 28th March 2007 that he was present at Grantham for the Installation of the Past Provincial Grand Master, Right Worshipful Brother Reverend Trevor John Walker. St Oswald's MMM lodge at Provincial Mark Grand lodge on Saturday had four Brethren receiving Active Provincial Grand Rank: W.Bros. Phil Aitken David Metcalf Richard Brady Martin Cooper. ... who was one of the first to offer sincere congratulations to R.W. Bro Steve Hallberg on his being installed as Provincial Grand Master for the Mark Masonic Province of Lincolnshire. You can read his message HERE. 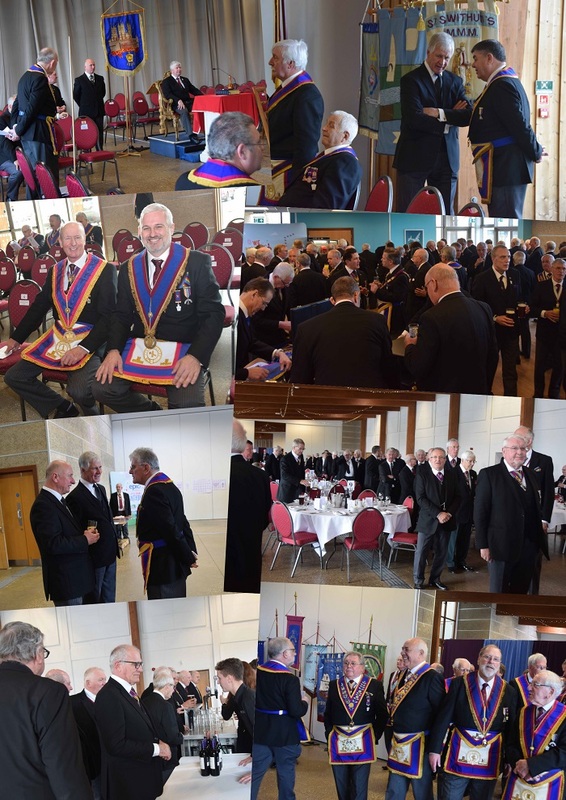 Provincial Grand Lodge 23rd March 2019. Brethren- It is an enormous privilege to be in this position and addressing you today. At the outset, I pay tribute to our immediate Past Provincial Grand Master , RW Bro Rev. Trevor Walker for leading us so magnificently for almost 12 years. I had the honour to serve under him for all but one of those 12 years and can state that so far as I am concerned our philosophy remains unaltered- that we continue to enjoy our happy and friendly Order to its fullest. If I learnt anything from Trevor, it was to have a good time enjoying the undoubted privileges that being a Mark and Ark Mariner Mason brings. I cannot replicate his personality but I can carry on the legacy he has left us, and try to build on that . I am confident our new Deputy and Assistant PGM’s will prove excellent choices and join with me in steering our Mark Province to greater success. One thing I can guarantee is if the subject of a new Provincial Mark tie ever crops up - I will be thinking long and hard about changing -I don’t have the luxury of a Priest’s collar to blame for not joining in with the rest of you! I thank you all for attending and especially thank our distinguished guests for making many long journeys to join us today. We certainly hope this will be just one of many visits to Lincolnshire. I also welcome all who are attending Provincial Grand Lodge for the first time. It is a pleasure for me to welcome newly Advanced Brethren into our happy Order and I hope this will be the first of many Provincial Grand Lodge meetings for them. Provincial Grand Lodge requires a tremendous amount of organisation , especially during this past year with two major events to plan, administer and deliver and I do sincerely thank our hard working Provincial Grand Secretary Steve Roberts, Provincial Grand Director of Ceremonies Keith Robinson and all the other Provincial Officers involved for their efforts too. The Brethren of today’s sponsoring Lodge St.Oswald’s Lodge , Scunthorpe, and, as always, the Lincoln Lodges have been busy setting up the rooms, transporting furniture, and undertaking many tasks. Sadly V W Bro John Clements steps down as our Provincial Charity Steward after 25 years in the role. John I cannot comprehend how many gift aid envelopes have passed through your hands and how many hours you and Pam have given up in dealing with our charitable giving. Thank you for making our LMBA Charity run so well for a quarter of a century, particularly culminating in the 2018 Festival . We wish you and Pam our very best wishes for a long and peaceful retirement. Taking over from V W Bro Clements is W Bro Mick Stocker and so Nene Lodge can now boast three very eminent Brethren in the permanent Offices in Provincial Grand Lodge- I know you all work very well together. We also welcome W Bro Les Darby in to the fold as Provincial Almoner. Regrettably W Bro Malcolm Forrest steps down after a decade of entertaining us with his wonderful music and we welcome W Bro Graham Steen who I know will delight us in similar fashion. All those I have invested today have been rewarded for services past, present and more especially future and I am confident you will all serve me and the Province well over the coming months and years. We also mark the retirement of W Bro Neville Storey as our Deputy PGM . 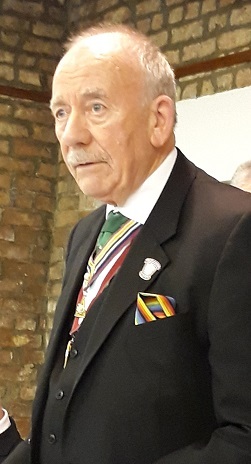 He has served our Province with distinction for many years since being made Provincial Grand Senior Warden in 2003, Provincial Director of Ceremonies in 2010, and serving the last two years as Deputy Provincial Grand Master . This last year has been a happy year for the Lincolnshire Mark Degree. 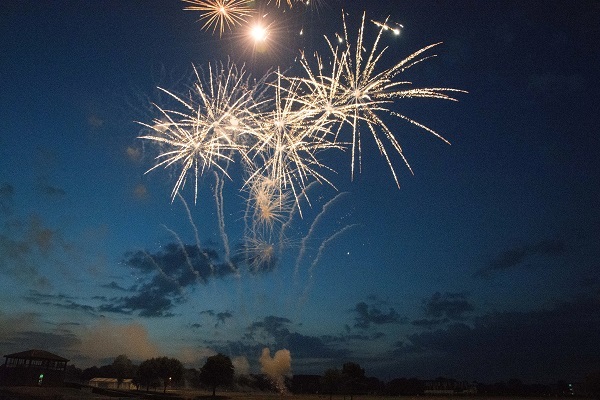 The 150th MBF Festival was held here on a red hot summer’s evening on 7th July last year. What a wonderful occasion that was with our Provincial Grand Master hosting the event and in good form. The staggering final total of £853,023 exceeded all expectations and can make us all very proud of the contribution made by Lincolnshire- not forgetting the financial support given by other Provinces particularly London , East Anglia and our own Craft Province . I also thank once again, our Craft PGM Rt W Bro David Wheeler and his Festival Committee for so ably steering us to the end result . 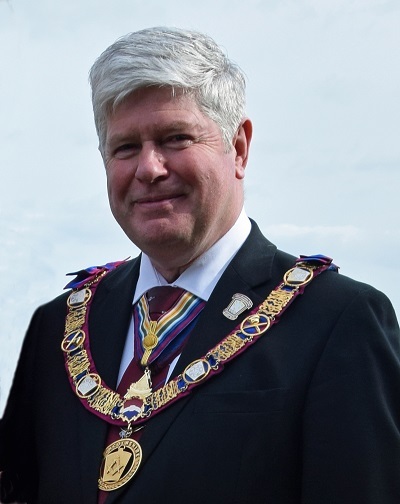 We thank each and every one of the contributors and I take the opportunity to wish RW Bro Martin Wilson PGM of Sussex every good wish for the 151st MBF Festival to be held in Brighton on 6th July – (Sir,) we are bringing a bus load to give you our support. On this subject I must emphasise the work of the MBF did not stop at midnight on 7th July 2018. We must keep up our support for the forthcoming Festivals in the same way others supported us . To that end I ask you all and Charity Stewards in particular to continue to use the MBF gift aid envelopes in our Mark and Ark Lodges using the MMM2106 suffix on the form. You will continue to be eligible for Mark honorifics and ensure your donations go in to our Relief Chest so Lincolnshire can afford to be generous to others in Festival over the coming years. I look forward as your PGM to presenting cheques to those in Festival as others have done so generously to us. As tangible evidence of the MBF’s work one of their projects in the last few years has been to replace over 50 St John ambulances across the country costing approximately £3.2 m.
I will be attending on your behalf a hand-over ceremony a week tomorrow - 31st March- in Spalding. It will be my first official engagement and I welcome as many of you as can make it to come along to St Mary & St Nicholas Church at 6.30pm, to show our support for both the MBF and St John’s ambulance service. Linked to this charitable giving is our Mark Prize Draw, necessarily tweaked in its constitution after the Festival, and now administered by W Bro Andy Carr and his team - I encourage all those participating to continue to do so. Not only does it distribute great prizes , it gives us the ability to fund both this Provincial Grand Lodge and use funds for Festival donations. Please do continue your support for this initiative which , thanks to the foresight of W Bro Mike Robinson when the Festival was launched raised over £50,000 for the2018 Festival. 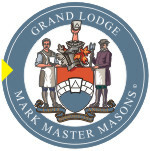 Turning to Grand Mark Lodge- I wish to thank publicly W. Bro. Ray Wade for organising the annual coach trip to the Investiture meetings in June- regrettably he has been unable to gain enough support to run it again this year and for that I am very disappointed- hopefully it means more of you will join with me and dine in the Connaught Rooms after the Grand Lodge meeting. Over the past 12 years our support for the quarterly meetings has been excellent and I very much hope you will support me and continue in the same vein. The dates and start times are on the GLMMM website to enable trains to be booked in good time and cheaper rates, however I can tell you it is a 1pm start in June . It will be good to have a strong contingent from Lincolnshire at each meeting and will also please the Pro Grand Master. We are a very happy degree but we must be a caring degree. To that end I encourage the work of the Lodge Almoners- do assist your Lodge Almoner by telling him whenever you hear of a brother or his dependents in need of assistance. Likewise I am of the opinion we can and should do everything in our power to prevent resignations . I charge every proposer and seconder to work with the Almoner and others to encourage that Brother to reconsider his decision. I note from the Registrar’s report that we suffered a larger than acceptable reduction in the number of subscribing members. It is about 2.6% but any decline is to be regretted . If we take the extra time and effort both to prevent resignations and encourage membership things will surely improve? However we remain a strong Mark Province - but we do need to ensure that we provide for the future. First we must make sure our Craft Lodges are strong and attracting new members . Secondly amongst the members of our Craft Lodges we must seek out men who will both enjoy and enhance our Mark Degree -they will then certainly bring in their friends. For those Lodges who are presently finding difficulty in attracting candidates - we will try to offer help and guidance on initiatives for recruitment being used successfully in various parts of the Province. I encourage all Lodges to consider helping neighbouring Lodges in need of support by reciprocal visiting by Lodges close to one another. Perhaps once each year get group together and go along and support a neighbouring Lodge, I’m sure they in turn will do likewise. It only takes one individual with a bit of effort to make these things happen. You should bear in mind that the Lincolnshire Provincial Officers’ Lodge will willingly help Lodges by providing Officers at short notice or indeed put on demonstration ceremonies to assist struggling Lodges. Contact the Provincial Secretariat for information if that appeals to you. Visiting is at the heart of all Masonry and especially so in the Mark degree. 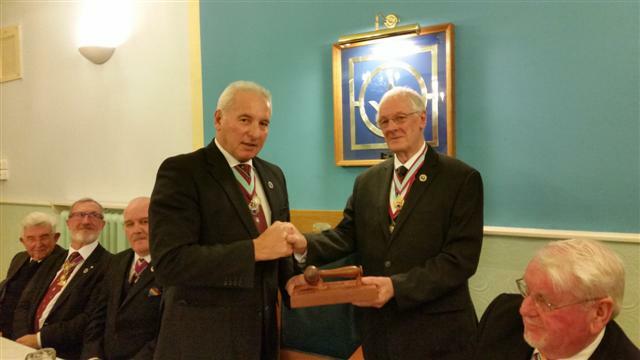 I was pleased to receive the Travelling gavel from W Bro Michael Drury the IPM of John O’ Gaunt Lodge, Gainsborough . 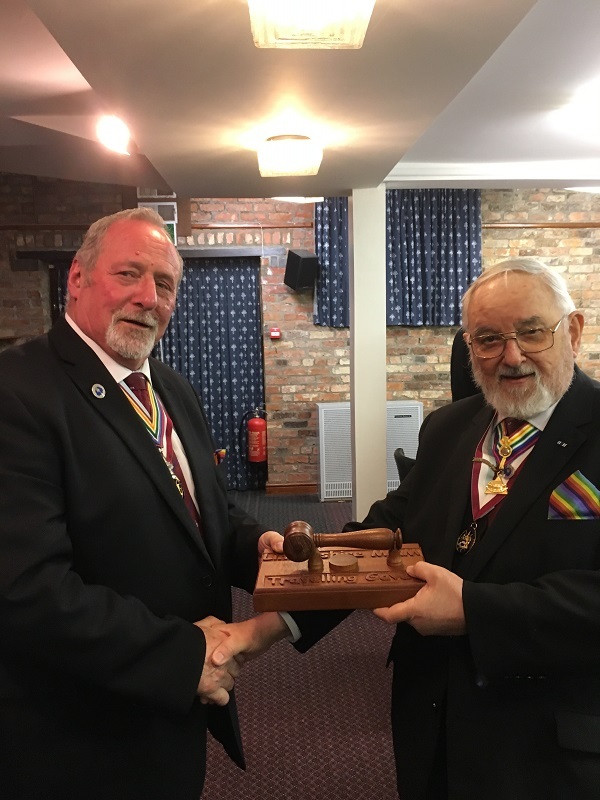 The gavel has journeyed around Lincolnshire encouraging visiting between our Lodges. 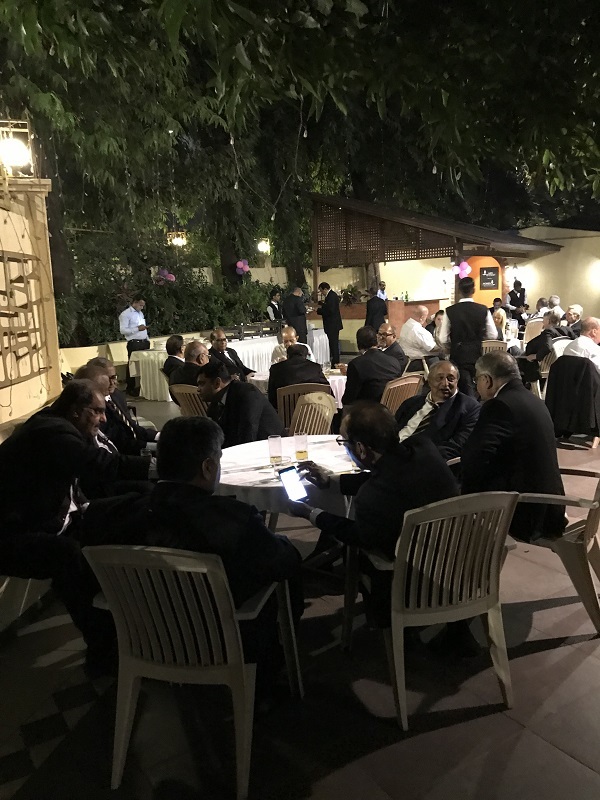 It really does work and I encourage the Lodges to arrange raiding parties – if you aren’t successful - I guarantee you a super night out with some friendly banter and competition . 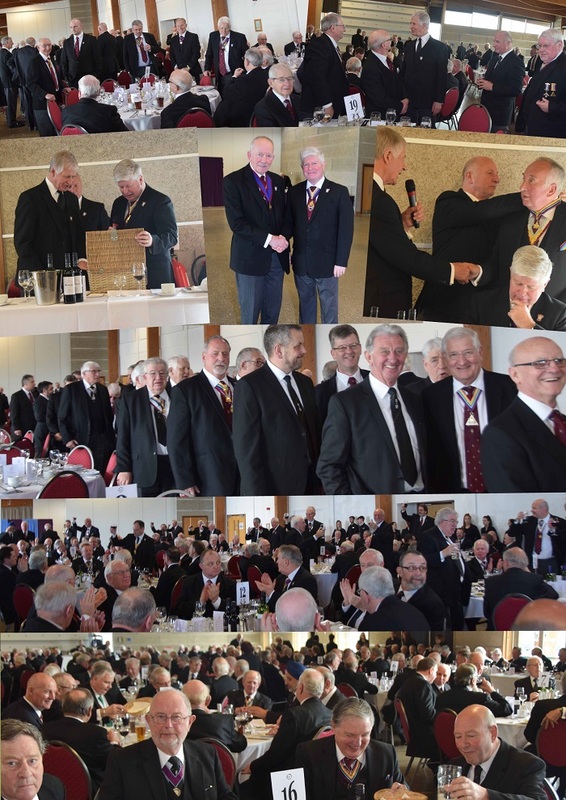 Please continue to chase the gavel and keep it moving – the revised rules of man/ miles encourages even the smallest of Lodges to have a good chance of claiming and then reaping the benefit of a bumper attendance at your next meeting. Visit our Provincial website to keep an eye on where the Gavel has moved. I thank you for the privilege of becoming your Provincial Grand Master and wish you every happiness in our Mark Masonic Order for many years to come. Deputy PGM saves Grimsby man from the clutches of an escaped lion. The brethren were reminded by the PGM during the installation of Deputy PGM W.Bro Ron Harrison that our DPGM had once saved a man from the clutches of an escaped lion. You can read the story HERE. Our recent 2018 Festival raised an astounding £853,023, an amount of which we as Lincolnshire Mark Masons should be justly proud. This donation, along with the money already in the fund and that collected since has been used by the MBF to fund a number of projects and schemes which assist both Freemasons and the general public, including a substantial donation to the 'Hope for Tomorrow' charity which provides mobile Chemo therapy units, one of which is now operating in Lincolnshire. A further scheme initiated has been the funding to provide 52 new ambulances and mobile stations for the St John Ambulance across the country costing £3 million over 2 years, an organisation which provides invaluable assistance to the community including ourselves at our various meetings. It is not often that we get the chance to see the fruits of our labour but please be advised that an ambulance is to be provided for the Lincolnshire Division of the St John Ambulance. The vehicle blessing/handover will be on 31 March 2019 at St Mary and St Nicholas Church, Spalding. PE11 2RA. The service will commence at 18.30 hrs and will last approximately 50 minutes and then we will go outside for the blessing and dedication. This is a unique occasion and I would therefore be obliged if you could circulate the details of the handover to all your members and request their support. Not only is it a celebration of our efforts but it will also be one of the first occasions that our new PGM will be 'out and about' in his new Office and it is hoped that a substantial number of the Brethren of the Province will turn out. To assist with the arrangements. Brethren who wish to attend, please let your Secretary know. Another great night of Mark Masonry at White Stone Lodge in Lincoln with some 57 brethren attending. The occasion was the presentation of a 50th year certificate to W. Bro Brian Hunt by the Deputy Provincial Grand Master in Charge, Neville Andrew Storey who took the opportunity to bring together brethren of the current active Provincial team for the last time before Provincial Grand Lodge takes place on the forthcoming Saturday. Our DPGM in charge gave a brief overview of W. Bro. Brian' s Mark Masonic service and thanked him for his commitment and contribution, both to the White Stone Lodge and also the Province of Lincolnshire. W. Bro. Brian himself was genuinely shocked at the presentation, being completely unaware that it was to take place and in turn thanked the Brethren for all their best wishes and kind thoughts.. The evening was rounded off by an excellent advancement ceremony of Bro Darren Sewell by the Worshipful Master and his Officers and the usual enjoyable and convivial festive board. 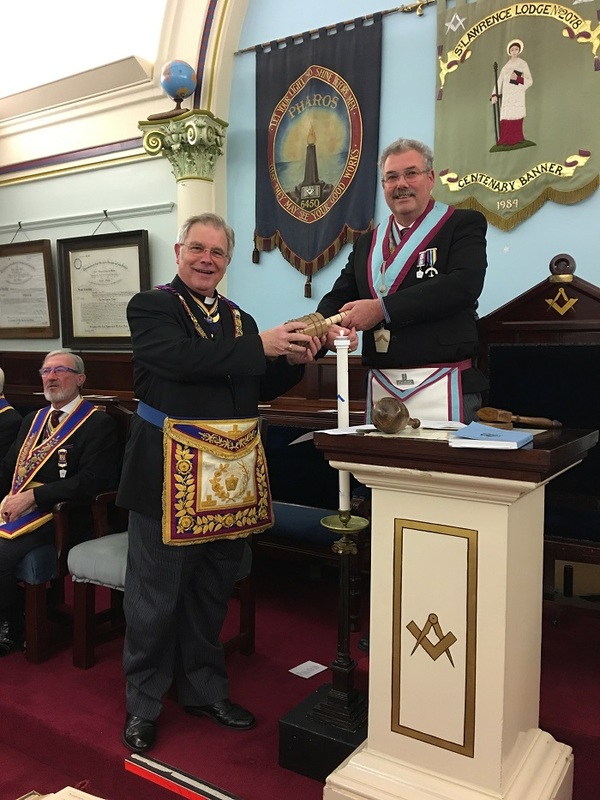 On Wednesday 27th Fabuary, St Oswald RAM Lodge No 387 claimed the Travelling Sceptre from St Denys Lodge. 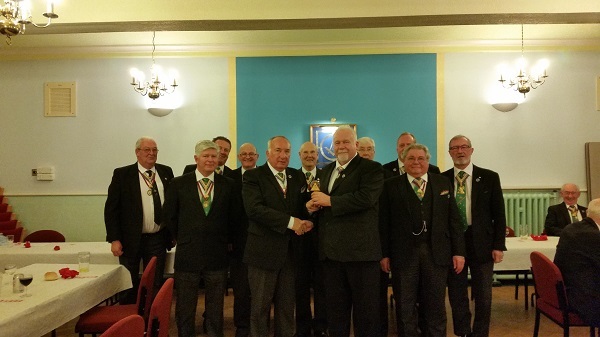 Eight Brethren travelled to Sleaford to claim the Sceptre. At the same time, eight Brethren from Trent RAM Lodge in Gainsborough also travelled to claim the Sceptre but St Oswalds won by virtue of superior mileage. The travelling Sceptre was an inspiration the late W Bro Alan Birkett, a member of St Oswalds MMM and RAM as an incentive to encourage visiting to other Lodges and last night it proved how successful it was, St Denys had a total of twenty Visitors. I am sure there will be an attempt by other RAM Lodges to reclaim the Sceptre at the next St Oswalds RAM lodge on 21st March. I should be very grateful if you would please convey to all the brethren of your lodge my sincerest thanks for the exceedingly generous cheque that was presented to me at the St. Wilfrid’s Lodge of Royal Ark Mariners Burns Night last Monday. When the Deputy Provincial Grand Master W. Bro. Nev Storey rose to make the presentation I was taken completely by surprise and most unusually for me was lost for words. I am overwhelmed by this generosity and do thank you all. It has been a wonderful delight to be Provincial Grand Master for nearly twelve years. They have been very happy years and I have been so proud to be PGM of such a wonderful Province as ours in Lincolnshire. Through all these years I have been fortunate to have the support of my wife Lynne who has enjoyed visiting other Provinces and attending our gatherings when ladies have been invited. She was quite overwhelmed by the beautiful bouquet of flowers that I brought home to her on Monday and asks that you note her gratitude for such a lovely gift. The generous cheque will allow us to plan a trip together that will not also involve a Provincial visit so Lynne is very grateful for that as well! She does though join with me in her thanks for this great generosity. I now ask you all to please fully support the Deputy in Charge over the next few weeks and then please enjoy the installation of W. Bro. 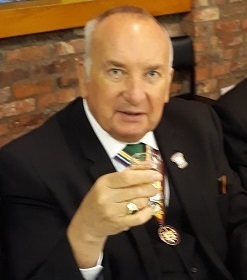 Steve Hallberg as Provincial Grand Master in March. It will be a splendid meeting and I know with your support he will lead our happy degree in the Province of Lincolnshire to greater success in the future. The St Wilfrid's Lodge of Royal Ark Mariner has just held it's annual Burn's night following the regular January meeting and an enjoyable and fraternal evening was held with 88 Brethren attending, the Lodge being honoured by the Provincial Grand Master and the Provincial Grand Master designate who were further supported by the Deputy PGM, the Assistant PGM and the Past Deputy and Assistant also. 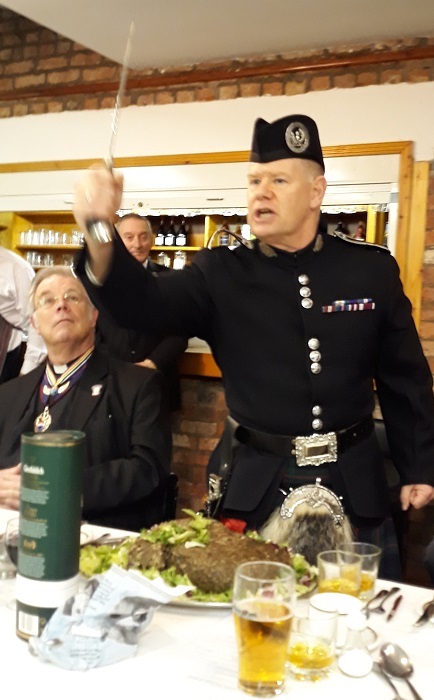 Having completed the necessary business, the brethren retired to the Festive board with the haggis being piped in by Bro Daniel Fleming who gave the address to the haggis and also the immortal memory. The event has gone from strength to strength since it's inception in 2002 and is now firmly bedded in the RAM calendar of the Province. As is now the custom , the Provincial Grand Master Designate. W Bro. Steve Hallberg. used the occasion to announce his Senior and Junior Wardens whom he will invest at Provincial Grand Lodge in the afternoon of March 23rd, these being W. Bro, Richard Garn, (Mercia 1240) and W. Bro. Andy Carr (White Stone 1203) respectively. The Provincial Grand Lodge meeting will be preceded by the Installation of our Provincial Grand Master Designate in the morning and he further took the opportunity to announce that he will be especially delighted to invest W. Bro. 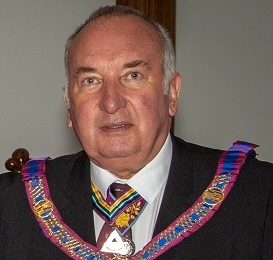 Ron Harrison as his Deputy and W. Bro. Jack Geelhoed as his Assistant, both of whom were present and received great acclaim from the Brethren attending. Many thanks to W. Bro. Tim Bird and W. Bro David Richardson for all their efforts in arranging such a wonderful evening of Mark/RAM Masonry (not forgetting W. Bro. 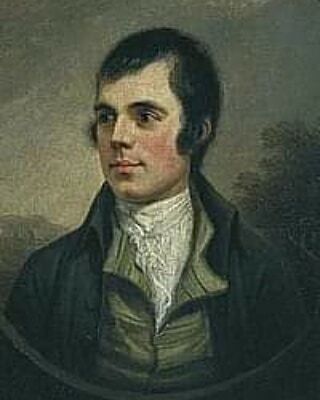 Robbie Burns also). 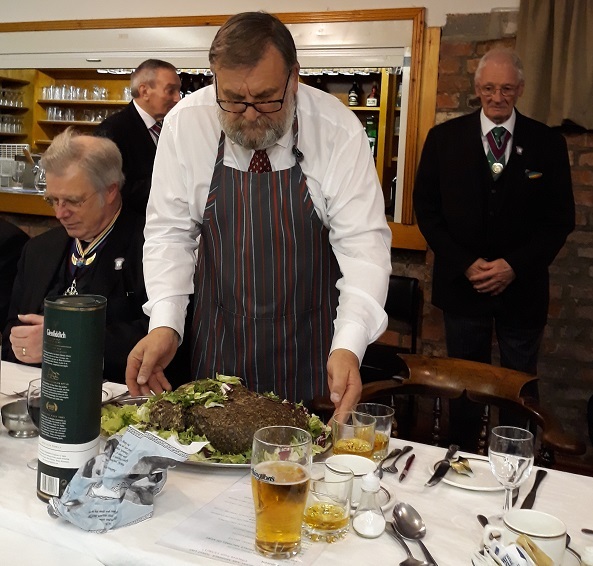 The recent Burns night held by St Wilfrid's Lodge RAM at Alford proved to be a memorable night for a number of reasons. The Burns celebration in itself was a superb evening of Mark fellowship at which the Provincial Grand Master Designate, W. Bro Steve Hallberg took the opportunity to announce his intended DPGM and his APGM along with his Wardens for the ensuing year. However, it was also the last meeting that our current Provincial Grand Master, Rt. W. Bro. Trevor Walker would attend in his role in which he has served the Province of Lincolnshire in such an exemplary manner for 12 years. He will of course retire from his Office on the 31st January. The current Deputy Provincial Grand Master, W. Bro Neville Storey gave a short speech regarding the Provincial Grand Master and his legacy to the Mark Province of Lincolnshire and presented him with a cheque for £2750 on behalf of all the Lodges and Brethren in the Province who had so generously donated to a retirement fund as a measure of their appreciation. R.W. Bro Trevor replied with his usual warmth and humour, advising the brethren that it was his wish to undertake a quite a bit of travelling in the near future (beyond Southport and Blackpool) following his retirement and that the Brethren of Lincolnshire would be in his thoughts when he did so, following which he received a standing ovation from the brethren who were privileged to be present. The Travelling Sceptre was last night successfully claimed from the St Wulfram's Lodge RAM by the Worshipful Commander and a further 9 brethren of the St Denys Lodge RAM. An enjoyable night all round with a good ceremony and an excellent happy festive board with the usual fellowship amongst those attending - The Provincial Grand Secretary even leant how to fire - eventually !!! The next and Installation meeting of the St Denys Lodge RAM is scheduled to be held on Wednesday the 27th February at Sleaford and all other Lodges are warmly invited to attend this meeting to claim the sceptre for themselves. Annual Convocation, Saturday 5th January. 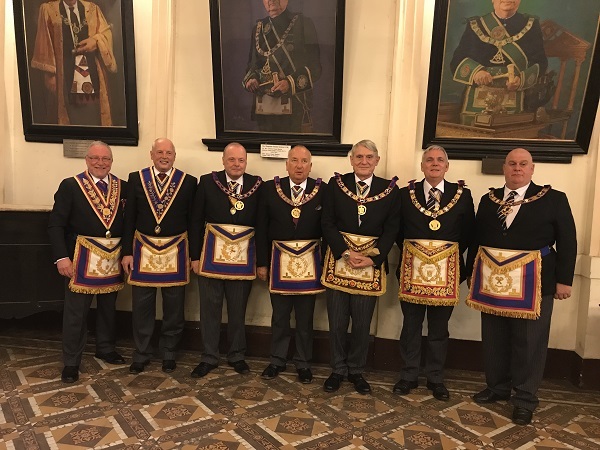 Lincolnshire was well represented at the District Grand Lodge of Mark Master Masons of Mumbai, Annual Convocation, Saturday 5th January, by our very own Assistant Provincial Grand Master, W.Bro. Ron Harrison and W.Bro. Phil Anyan. 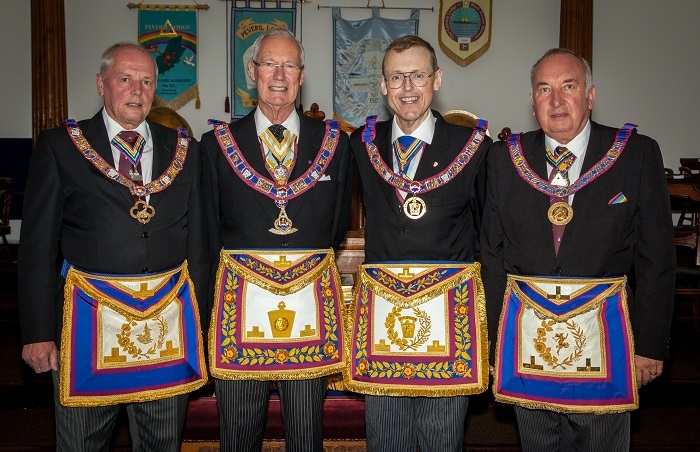 The District Grand Master, Stephen Hindes, third from the right in the picture below, originates from Woodhall Spa, Lincs. 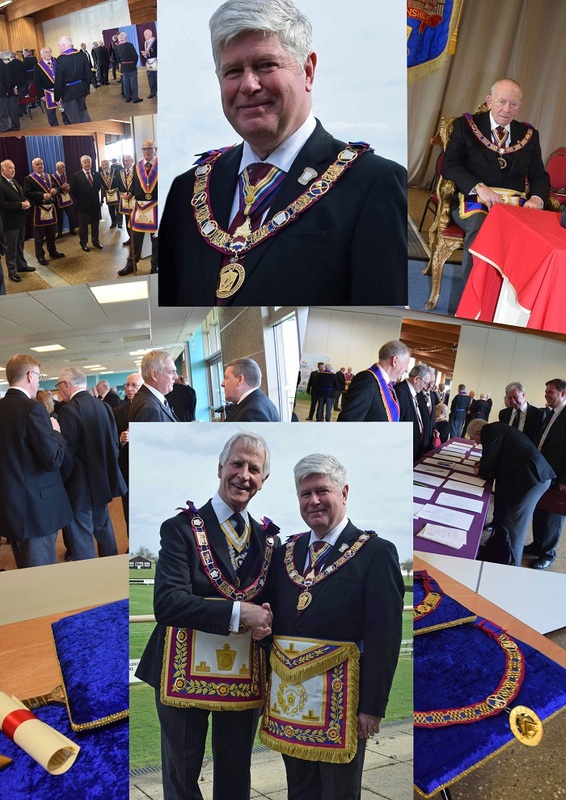 I am sure observant brethren will notice that the Festive Board shown in the pictures below, was somewhat different, being held outside. 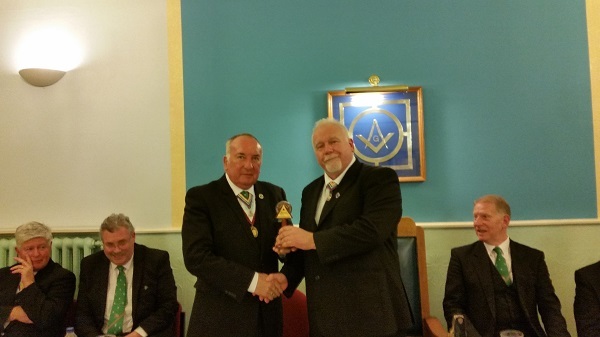 The Traveling Gavel is now in the safe hands of the John o Gaunt lodge No 172. 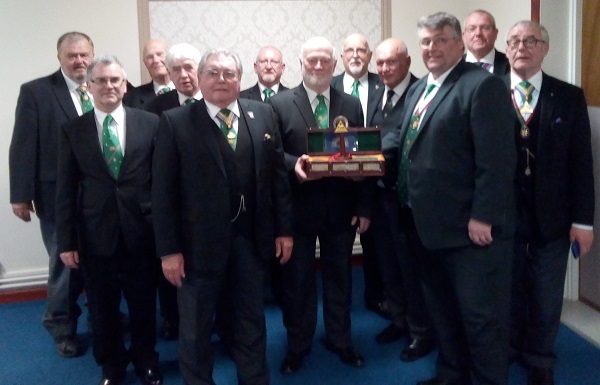 Brethren from the John O Gaunt Lodge MMM arrived in numbers and made a successful claim on the Gavel from the Urania lodge in Louth on Tuesday 13th Novmber. 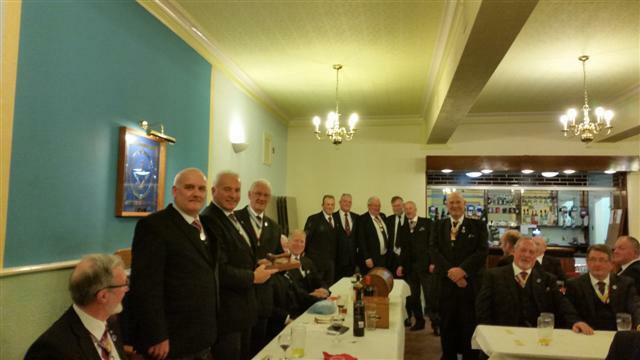 Why not get a group of brethren from your lodge to claim the gavel for yourselves at the next John O Gaunt meeting on Monday 21st January 2019. 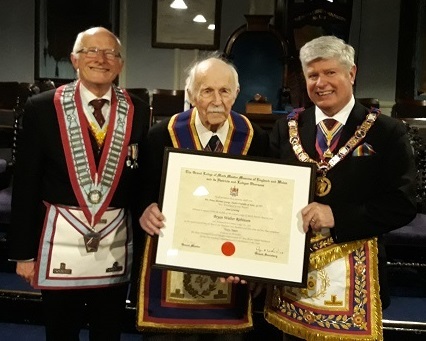 Rt W Bro Trevor Walker was please to present Bro Iain Morrison with his 50 Years Certificate in Mark Masonry. Iain took his Mark Degree in Scotland on 2nd November 1964 in Lodge Doric Killwinning No 68, Scottish Constitution. He joined St Oswalds Lodge No 387 on 12th January 1998. The WM of St Oswalds Lodge, W Bro Rob Pursey kindly presented the Lodge with a new set of Mallets for the WM, SW and JW. These were hand turned in Walnut with Ash handles. The PGM, RW Bro Rev Trevor John Walker dedicated and blessed the Mallets. The WM presented one to the JW (Bro Rick Brady), one to the SW (Bro Barry Bradley) and the PGM presented the WM with his. The Travelling Sceptre was claimed by the Worshipful Commander, and a number of Brethren, of St Wulframs RAM Lodge no. 916 from the newly installed Worshipful Commander of the Ark RAM Lodge no. 1910 at Alford last week on the 13th July. The next chance for your lodge to visit and claim the Travelling Sceptre for yourselves is at the next meeting of St Wulframs RAM Lodge is on the 10th of October at Grantham. 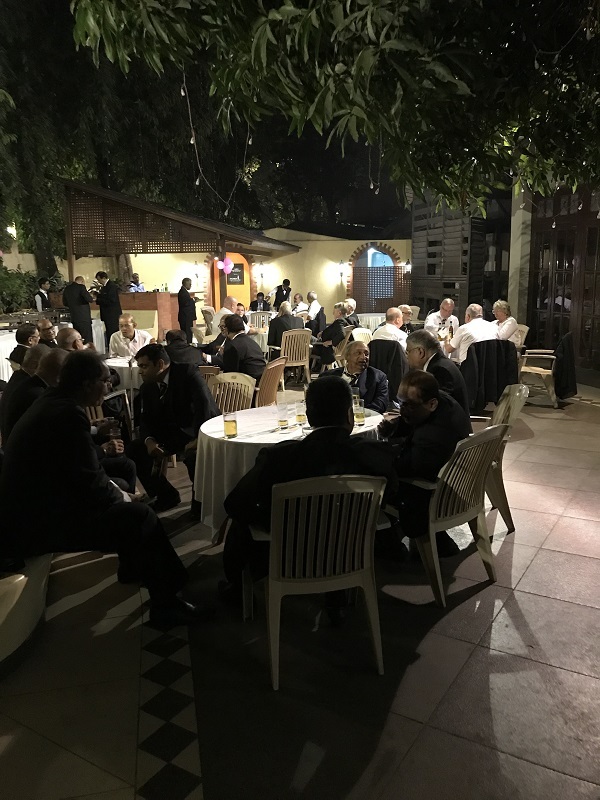 A total forty seven brethren attended the meeting, and a great night was had by all. 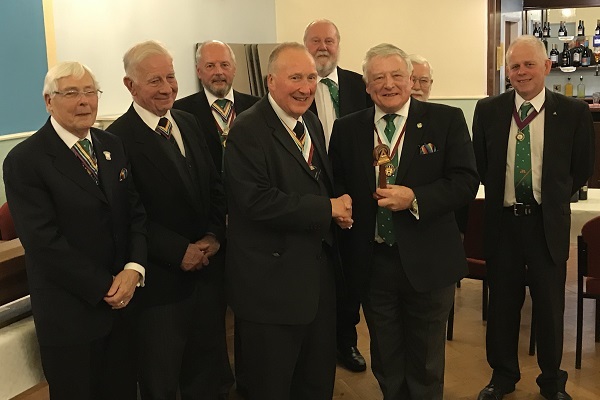 This picture shows W Bro David Burnett, the W Cdr of the Ark Lodge, handing over the sceptre to W Bro Stephen Heath, the W Cdr of St Wulframs, along with the accompanying brethren of his Lodge. £500.00 - Mrs. J. Robinson, W. Bro. I. Gilliatt, and W. Bro. D. B. Richardson. £400.00 - W. Bro. F. Clarke, W. Bro. J. Bush, and W. Bro. D. F. Price. £200.00 - W. Bro. G. Young, W. Bro. J. Haslam, and Bro. J. Robinson. £100.00 - Bro. J. G. Tasker, and W. Bro.C. Hunton. The 150th. 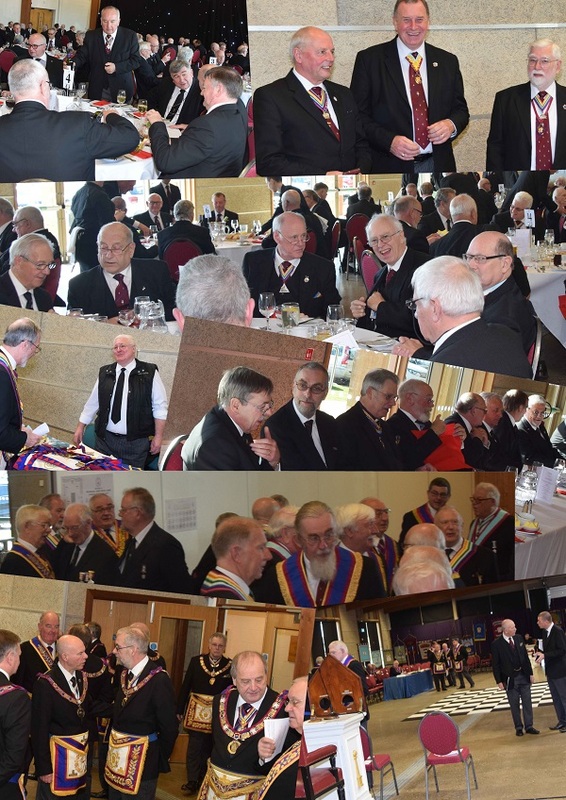 Mark Benevolent Fund Festival hosted by our splendid Mark Province of Lincolnshire came to a wonderful conclusion last Saturday 7th. July 2018. It was a great personal delight when the Grand Secretary Rt. Wor. Bro. Ryan Williams announced the total raised was a staggering £853023. This is a wonderful achievement and I congratulate the Mark and Royal Ark Mariner brethren. Over £853,000 raised for the 150th MBF Festival. 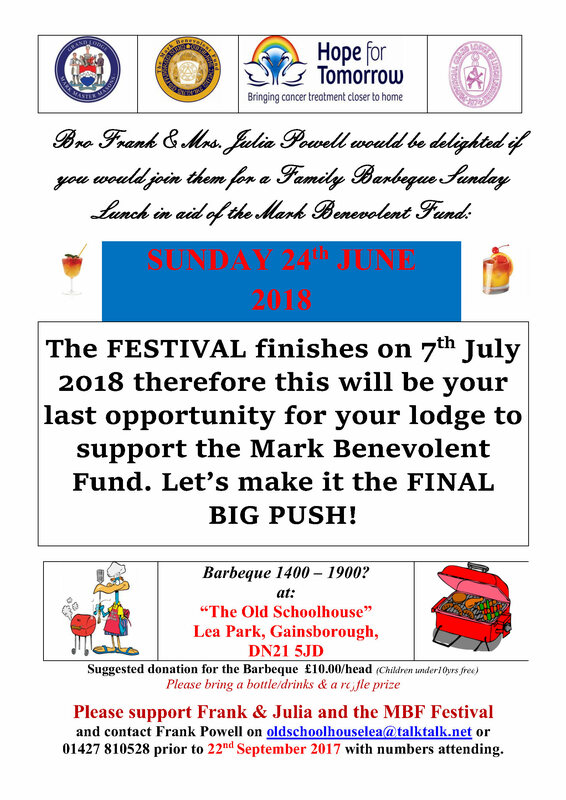 The 2018 150th Mark Benevolent Festival has come and gone. The countdown clock stopped on Saturday 7th July 2018. The party is over and the baton handed on to the Province of Sussex who will host the 151st Festival banquet on 6th July 2019 in Brighton. That's a short summary of what has been a tremendous effort on behalf of all Lincolnshire Mark and Royal Ark Mariners; their families and friends. The Festival weekend was a wonderful celebration and the culmination of many years of hard work by a lot of people. I thank everyone who took part, whether donating to the Festival or helping out at the numerous events that have been held. I know that everyone who was at the Festival banquet on Saturday 7th July 2018 will never forget the moment when R.W. Bro Ryan Williams, the Grand Secretary, revealed the total raised for the 150th MBF Festival. £853,023 is a staggering amount of money, raised over a short period of time and exceeds all expectations that anyone could have had when the Festival was officially launched in 2015. Thank you to you all on behalf of the Lincolnshire 2018 Festival Committee. 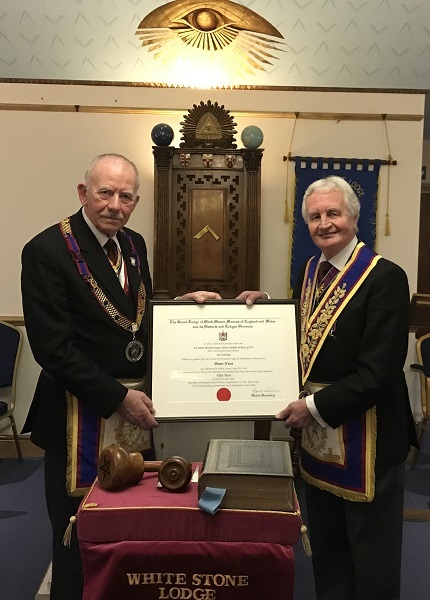 At the last regular and Installation meeting of the Millennnium Lodge of Installed Commanders no.1412, our Right Worshipful Grand Master, the Reverend Trevor Walker had the pleasure and honour of presenting his predecessor, Right Worshipful Brother Gordon Walkerley Smith with a 50th year Mark certificate. Right Worshipful Brother Gordon was advanced into the Sutcliffe Lodge MMM no.188 on the 12/01/1968 and has served this Province with outstanding commitment and diligence ever since, especially since having being Installed as the Provincial Grand Master for Lincolnshire in 1993 until 2007 when he handed over the reins to our current PGM. The Provincial Grand Master gave a brief overview of Right Worshipful Gordon's Mark tenure (to do so fully would have taken all night such is his contribution in the Mark degree) to which Right Worshipful Brother Gordon replied in his usual inimitable manner thanking all for the surprise and their support & friendship - A truly outstanding Mark Mason. The Provincial Grand Master also took the opportunity to present his good lady wife, Lynne with a certificate of appreciation to the 'Mark & RAM' ladies which had been received from the Grand Secretary on behalf of the MBF. 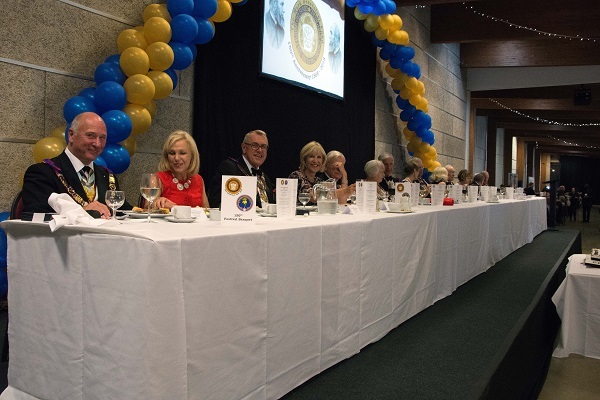 Since the 2018 Festival fund had been commenced in 2014 and unbeknown to any of the Brethren, the Ladies who have attended the various functions have undertaken to raise their own contribution to the fund, culminating in the presentation of a cheque to the Provincial Grand Master for £1000.00 at the RAM Provincial Assembly - who says a Lady cannot keep a secret !!! Ladies all, we thank you for your support and generosity. Once again Frank and Julia Powell pulled out 'all the stops' to host a magnificent summer barbecue at their lovely home, the Old Schoolhouse, Lea, Gainsborough on Sunday 24th June 2018. All in aid of the MBF 2018 Festival, the food; drink; weather and company were exceptional and a great time was had by all who attended. Available drinks included a local brew, 'vino collapso' which went down extremely well and there was also a chance to end the day with a substantial measure of Pussers rum which, as a former submariner, was Frank's parting shot. 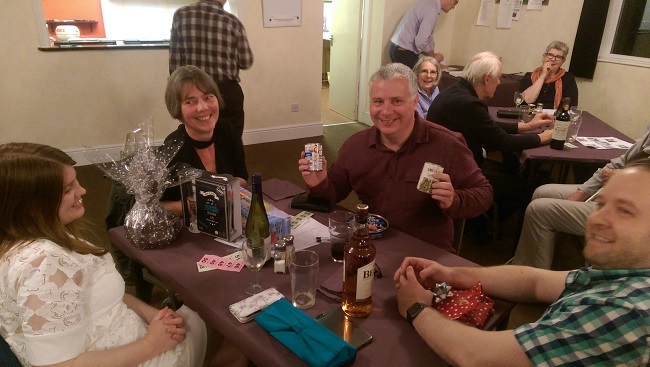 There was also a very enjoyable raffle with many prizes to be won so everyone went away very happy. The happy and very successful afternoon raised the tremendous sum of £500 for the MBF 2018 Festival and grateful thanks go to Frank and his family for, once again, putting on such a wonderful event. 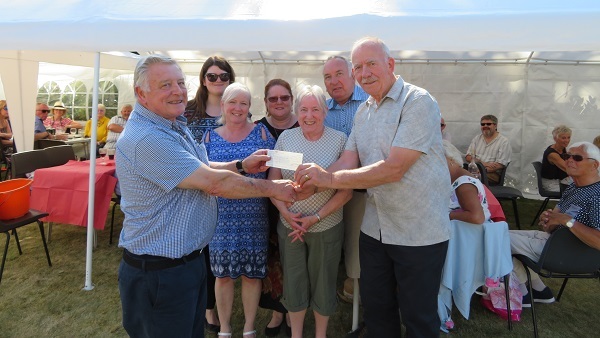 The photograph shows, from left to right, Brother Frank Powell; his daughters and granddaughter; wife Julia; APGM Ron Harrison and DPGM Nev Storey receiving a cheque for £500 for the 2018 MBF Festival. Many thanks to all the lodges who conducted a "Heads and Tails" competition. A draw has been made and the Provincial Grand Master presented the football to the winner....W Bro John Speed at the Royal Ark Mariner Provincial Assembly in Grimsby. Apologies go to W Bro Steve Roberts who wanted to kick it into the river Slea!!!!!!!!!!!! The annual coach trip has been organized by W. Bro. R. Wade for the Grand Mark Annual Investiture on the above date. Each year the Province is well represented at this meeting to support those being promoted or receiving their first appointments. All Mark Master Masons are invited to attend, and those who have never been to Grand Lodge are particularly encouraged to attend this splendid occasion. A full itinerary together with costs can be download if you click HERE. If you would like to attend, please contact W. Bro. R. Wade with the information requested. Please be advised of the following appointments to Grand Mark for Lincolnshire Mark Brethren which will be conferred at the Grand meetings on Tuesday the 12th June (Active Officers and 1st appointments) and on Tuesday the 11th September (Promotions). I am sure that you all will join the Provincial Grand Master in congratulating these Brethren on their forthcoming appointments, whom I am sure would welcome your support at the respective meetings. Read all about Arthur's exploits detailed in the Market Rasen Mail by clicking HERE. by Rt W Bro Rev Trevor Walker. It is a very great pleasure for me to welcome everyone to this 144th. Meeting of the Provincial Grand Lodge of Mark Master Masons of Lincolnshire. Thank you for your support and I hope you will discover friendships renewed, new friendships made and great enjoyment from visiting Lincoln. A most important item in all our Masonic Meetings is to welcome our guests. I have already welcomed our distinguished guests and heads of other orders but brethren I am sure you would join with me in emphasising just how delighted we are to welcome so many who have travelled long distances to be with us. We are delighted you are here. We too have travelled from Lincolnshire. Last June many brethren journeyed to London to witness the impressive installation of the Pro Grand Master, Deputy Grand Master and Assistant Grand Master by the Most Worshipful Grand Master. Freemasons Hall was packed to capacity and similarly afterwards the Connaught Rooms struggled to dine some two thousand brethren. Nevertheless it was a most memorable day for all who were privileged to be there. At Grand Lodge the Grand Master invested W. Bro. Gary King as Assistant Grand Standard Bearer and appointed W. Bros. Len Armiger and Barry Humphrey to the rank of Past Assistant Grand Director of Ceremonies. W. Bro. Dave Wheeler was appointed Past Assistant Grand Sword Bearer and W. Bros. Malcolm Forrest and Roger Hansard were promoted to the rank of Past Grand Junior Deacon. We once again congratulate those brethren on receiving these well-deserved honours which are a credit to them and our Province. Now I have just said the meeting last June was extremely well attended but unfortunately this meant some were not able to be accommodated in the Grand Temple nor able to dine in the main dining room afterwards. Grand Lodge realised this situation is not acceptable and decided to address the problem. 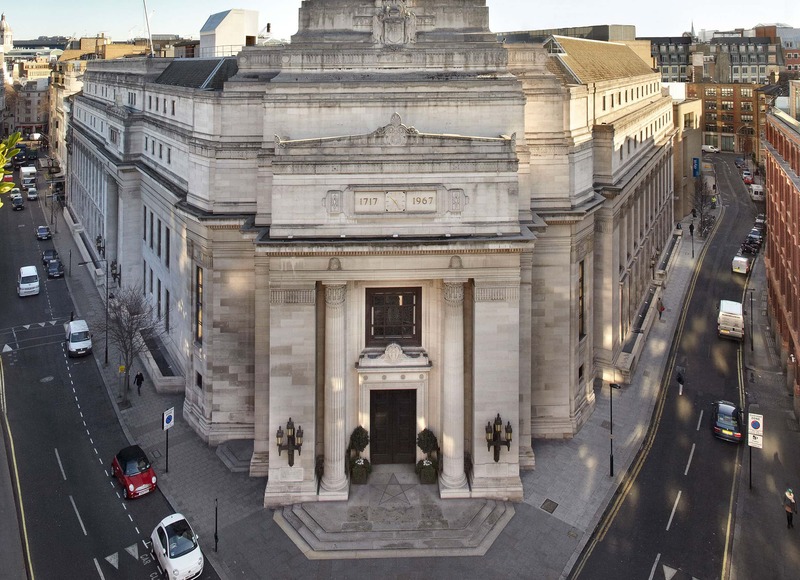 This year those appointed to active Grand Rank and those receiving first appointments will be invested as usual at the June meeting of Grand Lodge. Those receiving promotion in Grand Rank will be invested at the September meeting. Please also note that letters offering promotion will not be sent until after the June meeting. So if you have not received the letter you thought you were going to receive in April – don’t lose heart it might still arrive in June! Hopefully this new arrangement will alleviate the pressure on the June meeting without having to restrict the number of those attending. So please come to Grand Lodge in June to support those getting active or first appointments. We are all very grateful to W.Bro. Ray Wade for arranging the usual coach to Grand Lodge. It is hoped this year you will find it easier to obtain a seat in the Grand Temple. Each year I am delighted to welcome the Worshipful Commanders and representatives of the Royal Ark Mariner Lodges into Provincial Grand Lodge. If you are not yet a member of this lovely order then I urge you to seriously consider joining. I also remind you that we hold an Annual Provincial Royal Ark Mariner Assembly alternating between Grantham and Grimsby. This year the meeting is at Grimsby on 18th. May when I shall invest the recipients of Royal Ark Mariner Provincial Grand Rank. After the meeting we shall dine together with our ladies and guests. Do please support this meeting which is always a very happy and enjoyable occasion. I now wish to thank the Provincial Officers who have supported the Team Visits we have made since last April. The turnout has been tremendous and as I have said before and will not cease to say I always feel so privileged to walk through such a long column of officers on our entry into lodge. I know it is an impressive sight for the members of the lodge we are visiting. I look forward to further team visits this coming year with the officers appointed today. I also thank the lodges we visit for their wonderful welcomes and the hospitality so generously bestowed. Brethren of Lincolnshire can I tell you that when you are represented either by myself or others from this Province on our visits to other Provinces we without exception receive wonderful hospitality. It is a privilege but also a very great pleasure to make these visits and I thank again those other Provinces for their generous and warm welcomes. I hope their visit to Lincolnshire today will be some small return and be as enjoyable to our visitors as the hospitality we have received. Visiting is at the heart of masonry and this is especially true for the Happy Degree. Several years ago we inaugurated the Travelling Gavel and Travelling Sceptre to encourage visiting in the Mark and Royal Ark Mariner Lodges. 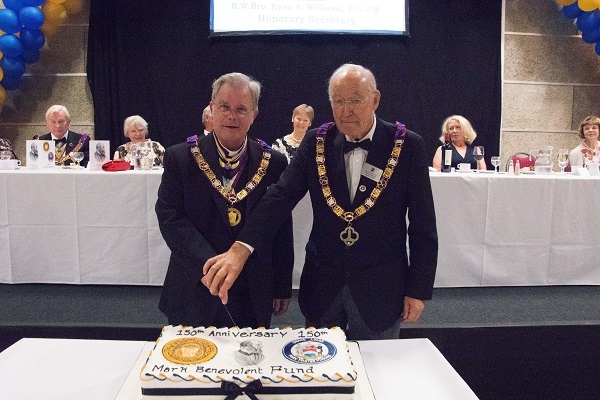 Over the years they have moved the length and breadth of Lincolnshire and raiding parties to claim the gavel or sceptre have boosted lodge attendances immensely. Most importantly these visits have made for more happy meetings and more new friendships made. Because of the gavel and sceptre some lodge attendances have exceeded eighty. Please do continue to visit around the Province. I have enjoyed receiving reports from those representing me at Installation meetings and from the Provincial Grand Wardens. I am pleased to note that our lodges are in good heart with candidates being advanced and good ceremonies performed. Complacency though is not an option and we must always be looking for the right master masons to join the Mark. Likewise the standard of ritual must always be maintained. It is not acceptable to read the ritual for learning means understanding it and only then can we convey the meaning to the candidate. Please do keep up those good standards that have been reported to me. Our meeting today is primarily for the appointment, promotion and investiture of the Provincial Grand Officers. I congratulate all those I have just appointed, promoted and invested and thank you for all your efforts in the Mark that has earned you this honour. I am sure I do not need to remind you that it is also an encouragement for further service in the Degree and to your lodges. That goes without saying. But I do say it, I said it last year and I say it again, without apology. I now wish to record the tremendous work done by the Provincial Wardens. W. Bro. Colin Fox and W. Bro. Tim Bird have visited all the lodges in the Province travelling from one end of Lincolnshire to the other – and that can be a long way! I know they have enjoyed their year in office and I am sure W. Bro. Bruce Goodman and W. Bro. 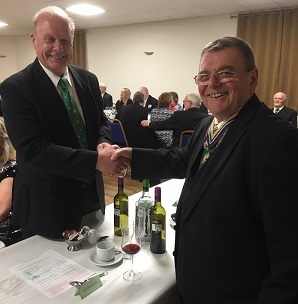 Steve Siddall will have an equally successful and enjoyable time as Provincial Wardens this year. I am sure you will welcome and look after them when they visit your lodges. I looked at the Provincial web site so expertly maintained by W. Bro. Craig Maurier and noticed the clock is still counting down. Only 104 days to go until the 150th. MBF Festival which we shall host in this building on 7th. July. All the arrangements have been made with my very grateful thanks to W. Bro. Dave Wheeler and the members of the Festival and Banquet Committees. It will be a most splendid and memorable occasion and I urge anyone who has not yet booked their place at the banquet to do so without further delay. You really will not want to miss 7th. July and your wives and partners will not forgive you if you do not bring them to the festival. I am staggered at the number of fund raising events and efforts that are taking place. W. Bro. Ed Backus’ sponsored bike ride, W. Bro. Mick Stocker walking over 1000 miles, W. Bro. Geoff Burgoin and the Spires and Steeples half marathon, W. Bro. 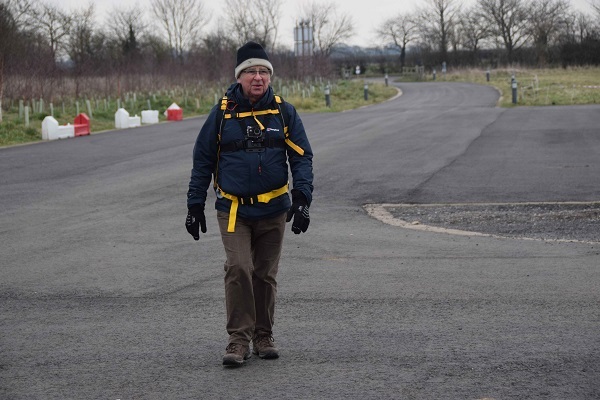 Arthur Baxter walking from Market Rasen to Leicester. Events still to come are W. Bro. Richard Woods and the model railway exhibition on 7th. May and the Family BBQ on 24th. June with thanks to W. Bro. Frank Powell. These are just a few events brethren. Thank you for your continuing support of the MBF by your individual donations and support of the Mark Draw. I know that your support has been extremely generous by the number of MBF honorifics I have presented. I now ask the Provincial Grand Director of Ceremonies to please conduct W. Bro. Dave Wheeler to the pedestal. W. Bro. Wheeler by command of the Most Worshipful Grand Master I am delighted to present you with your Grand Patron Diamond Award. Thank you for your generosity but also for your hard work as chairman of the Festival Committee. I also take this opportunity of congratulating you on being our Provincial Grand Master elect for the Craft in Lincolnshire. Do enjoy many happy years as Provincial Grand Master. Freemasonry is a family. This is shown to me by the way in which all our masonic orders work together in mutual support. I have seen this particularly in the most generous donations I have received for the 2018 Festival. I have already acknowledged the outstanding donation from the Lincolnshire Craft Province. Brethren I have received donations for the Festival from many orders which to me has been most humbling and shows what freemasonry really is all about. Helping one another. I thank the Allied Masonic Degrees, the Worshipful Society of Freemasons, the Holy Royal Arch, Order of the Secret Monitor, the Scarlet Cord to name just a few. We are on track for a Festival Total that I am sure will make Lincolnshire proud. I look forward with great anticipation to that moment on 7th. July when our Festival Total will be announced. If you are still wondering how you might assist at the Festival then I have been asked to say that because of extra bookings just being taken more stewards are required. Please contact the Provincial Grand Director of Ceremonies W. Bro. Keith Robinson if you are able to offer your services in that capacity. He will be extremely pleased to hear from you. Meetings such as this one require much work. The brethren of the Urania Lodge No. 326 and the brethren of the Lincoln Lodges have undertaken the local arrangements by preparing the lodge room, transporting furniture and all the preparations of these last few days. I thank W. Bro. Malcolm Forrest our Provincial Organist, not just for the wonderful music, but also for getting the organ here. 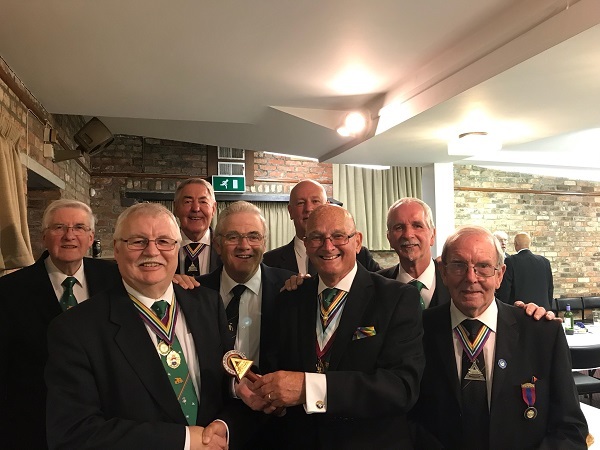 The Provincial Stewards and Directors of Ceremonies with their team have provided flawless choreography, and the Provincial Grand Secretary and his team have seen to their usual highly efficient arrangements. Thank you brethren. Time marches on and change as they say is inevitable. This is now the twelfth Provincial Grand Lodge I have called. I have enjoyed them all immensely and they have been occasions I shall never forget. This Provincial Grand Lodge of 2018 is special in that I have not had the opportunity to appoint W. Bro. Steve Hallberg to any office. W. Bro. Provincial Grand Director of Ceremonies please bring W. Bro. Hallberg to me. W. Bro. Steve Hallberg you have served this Province and me as a most efficient Provincial Grand Secretary and before and after as Deputy Provincial Grand Secretary. As a small token of my gratitude for all your help and assistance I now present you with my Certificate of Merit. As I have just said brethren time marches on and now I, and I am sure you, will be pleased to know it is time for me to cease talking that we might proceed to our refreshment. I thank you all for your attention and look forward to welcoming you here in July for the Festival. I wish you a happy Mark Masonic year ahead and may the Great Overseer ever bless and keep you. 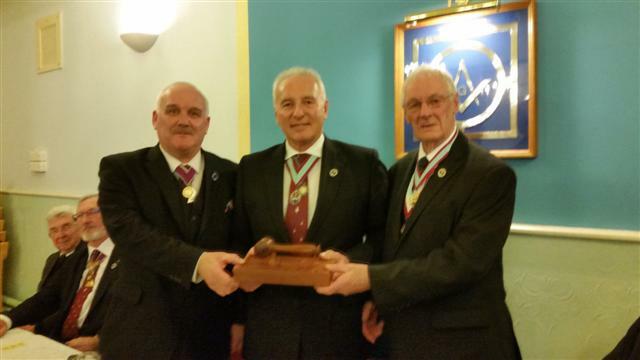 The travelling gavel was claimed on Tuesday 20th March from St Wilfrid's Lodge MMM No. 209 by Urania Lodge MMM No. 326 - the PGM's own Lodge and just in time for Provincial Grand Lodge! The Traveling Gavel moves on again. Why not get a group together from your Mark Lodge and go and claim it for yourselves? The Ark Lodge of Royal Ark Mariners claimed the Traveling Sceptre last night from St Owald RAM Lodge No 387. Eight members had travelled to St Owald RAM Lodge to claim it. Thirty two brethren enjoyed the comradery at this splendid meeting. See if you can get a group from your own RAM lodge to claim the travelling sceptre for yourselves, and add to the fun. At a presentation ceremony in his home on Monday 12th March 2018, W.Bro. 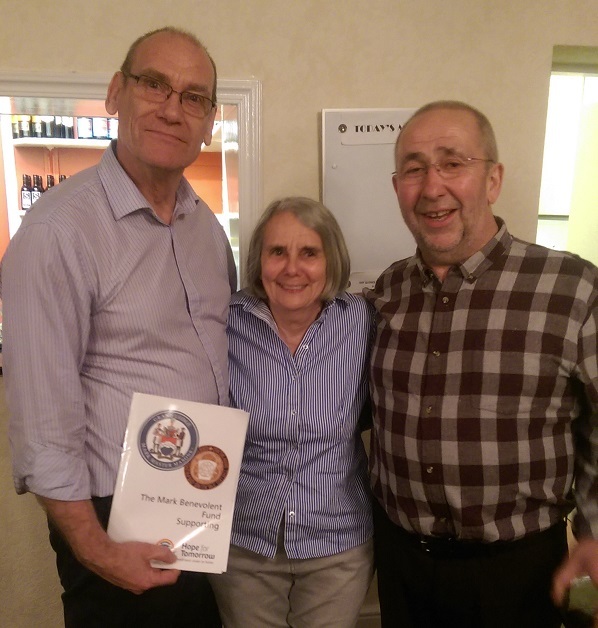 Peter Bray PrRAMGR of Mercia RAM Lodge 1240 in Spalding was presented with his RAM 50 Year Certificate by senior members of the Lodge. 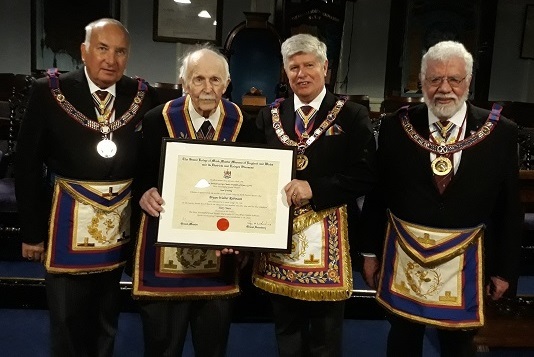 W.Bro Bray (aged 93) will in fact be celebrating 55 years in the degree in 2018 but had somehow managed to slip through the net regarding his certificate! The Lodge Scribe, W.Bro Barry Humphrey RAMGR explained to W.Bro Peter that a recent trawl of Lodges, at the request of the Provincial Secretary, had uncovered the anomaly and that they were there to put matters right. 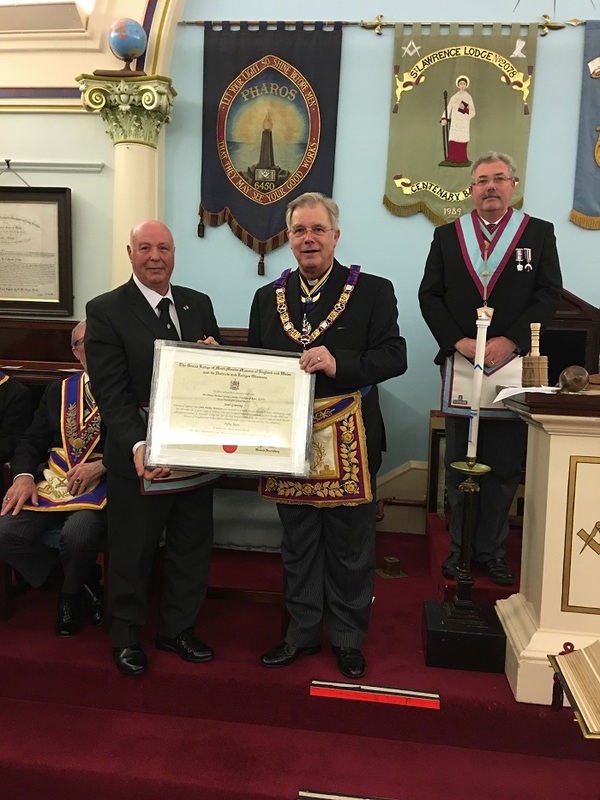 The Certificate was then formally presented by W.Bro. 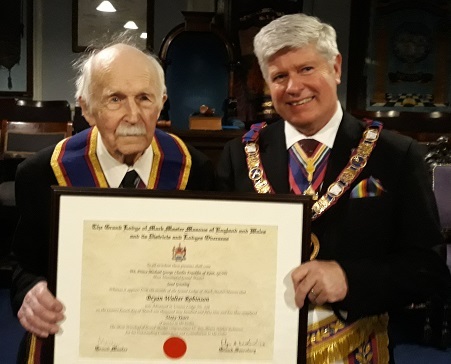 Bryan Robinson RAMGR aged 92, the senior member of Mercia RAM Lodge and himself a holder of a RAM 50 Year Certificate (and currently heading towards 60 years service) and W.Bro Douglas Drakard RAMGR (age 81) the third senior member of the Lodge after W.Bro Peter Bray. 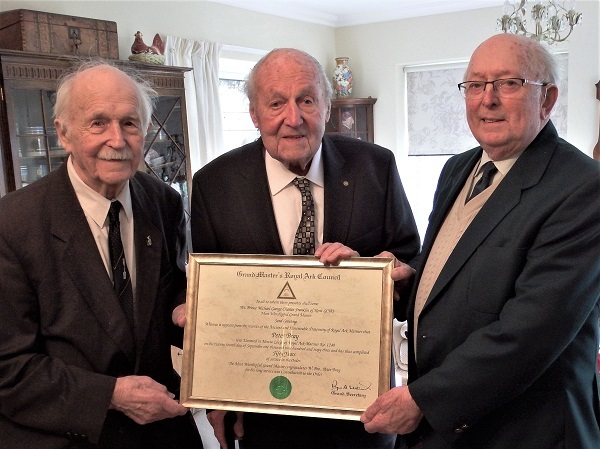 The photograph (showing left to right W.Bro Bryan Robinson, W.Bro Peter Bray and W.Bro Douglas Drakard) with over 153 years of service between them, was taken by W.Bro Barry Humphrey RAMGR, Lodge Scribe. ... was Joy Geelhoed with Runner Up being Bro. Chris Rimington who both scored 50/50...the winner being decided by a draw. Just to prove that it was not a fluke and what experts they are at these quizzes, the winner of the Castles Quiz, again with 50/50 was Joy Geelhoed... the Runner Up was Bro. Chris Rimington who got 49/50. Many thanks to all who submitted entries. My walk started with a great send off by the President Tony Smith and members of Market Rasen and Louth RUFC AT 8-30 am with a weather temperature of -1 deg C , and a sprinkling of snow. The Club had pledged the sum of £250-00 so I was warmed by this generosity for two very worthy causes. I proceeded to Linwood, Lissington, Wickenby, Snelland, Scothern, arriving at Lincoln Rugby Club Nettleham at 3pm. A few photographs were taken and I proceed to Lincoln Cathedral thus ending my journey at around 4-15pm., having completed 18.9 mile. Well and Truly worn out. I did not want to get out of bed ! Or rather I couldn't. My hips sere sore, my feet were sore, and old sporting injuries seemed to return. I was thinking ! What excuse can I make so as not to go. All the way to my start point, I was still thinking ! How can I get out of this. I could not think of any good reason, so I started my journey to Newark. Called at Pennells for a quick cuppa. After a couple of "painfull miles" I headed towards Haddington, Thurlby, Bassingham, Norton Disney to Stapleford. Taking the route through Stapleford woods, which was endless. I continued into Newark down the hill ( thankfully not up the hill) and was beginning to tire. I past the Castle and headed for Newark Rugby ground. Arriving at 3-20pm. I met the President of the Club Mr Alan Swain, who was very accommodating . I had another cup of Tea and more photo's. I started my journey from Newark at 8-30 am, Feeling pretty well considering the journey so far. I was anticipating rain, sleet and brisk winds. However! Fortunately neither appeared. I hit Long Bennington and picked up the Viking Way across the A1 motorway. The state of the Viking Way heading towards the Grantham Canal is terrible. A real disgrace. The servicing of the fields by the farmers is a necessity, and must come first. However! The water levels and "deep ruts" by tractors in my opinion is dangerous. Perhaps notices saying "not recommended for use at this moment of time"
You guessed it ! I fell in a trench after it gave way. I eventually made the Grantham Canal and had a pleasant walk along the "Tow Path" into Grantham. Faced with the prospect of Somerby Hill to the Kesteven Rugby Ground, I headed through Grantham Town appearing like a "mud man" and receiving some very strange looks. I arrived at Kesteven RUFC about 3-30 pm, about 1 hour ahead of schedule. Again! I was greeted by the Club President Mr Mick Money, along with 6 other club members. The clubs press officer reported my walk to BBC Radio Lincs, who I gave brief details to. I understand BBC wish to talk to me again when I set off on my next leg from Grantham to Melton Mowbray. I received the sum of £340 with a further amount to be donated shortly. I have noticed on my journey how close the clubs are with each other, the friendships they have made over the years, and the respect for each other's efforts. Keep it up. Market Rasen and Louth. ? I am already looking forward to the journey to Melton Mowbray and Syston. My journey takes me from Melton Mowbray to Burrough on the Hill, where I will be visiting the New Matt Hampson Foundation Building which is named Better Living and is for those sportsmen who have suffered Catastrophic sporting injuries. No doubt I will find it a bit emotional seeing these youngsters. So the Matt Hampson Foundation will benefit so will the MBF who have pledged £2.6 million pounds to "Hope for Tomorrow " for 10 mobile Chemotherapy units. One of which is based at Lincoln Hospital. This Unit travels to Boston, Skegness, Louth, and Grantham and saves already poorly patients the arduous journeys traveling to major hospitals for treatment. This has already saved patients in excess of some 2 million miles travelling. So two very worthy causes. I must thank John Wood of Rasen, who has been there for me at every twist a turn to ensure I was ok. Middle of nowhere he would appear. Taking me to my start point and picking me up at the daily finishing point. I thank members of Market Rasen & Louth RUFC particularly Tony Smith, adding his weight to introduce me to other clubs. Secretary Claire Fenwick , for taking my request forward, and not forgetting those who turned up in the freezing cold to see me off. 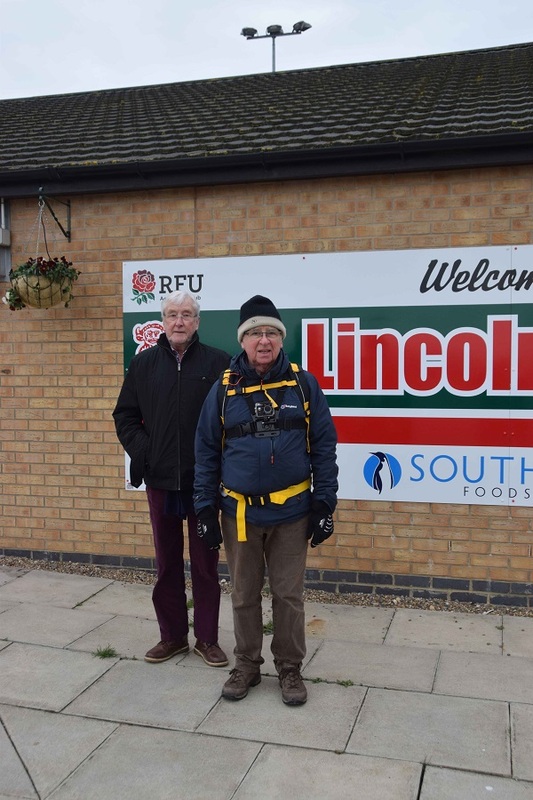 Arthur with President of Newark RUFC Mr Alan Swain, after competing Stage 2, Lincoln to Newark RUFC 8th February . As the 2018 Festival end date of 7th July 2018 is rapidly approaching there is a need to ensure that all Festival merchandise and monies for the same are consolidated as soon as possible. If you have any pens, ties (both RAM and Mark) coasters, tokens, key rings, cufflinks or 2018 lapel badges, or the cash raised from selling these items, can you ensure it is passed over to Dave Wheeler at the Mark Provincial Grand Lodge on Saturday 24th March 2018 please? Dave will be looking after a table selling such items in the foyer of the Events Centre, Lincolnshire Showground and will be on site from 08.30. 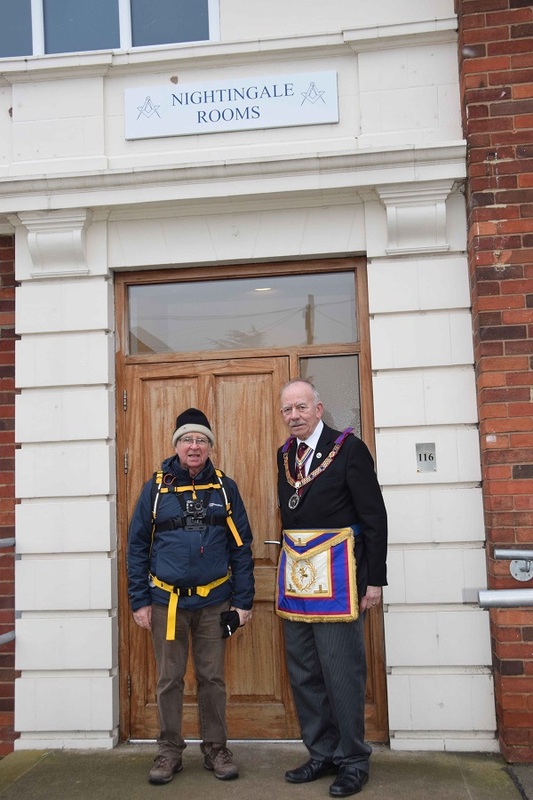 Last year W.Bro Mick Stocker pledged, in the presence of Rt W Bro Trevor Walker, that he would walk a cumulative 1000 miles between 1st January 2017 and 31st December 2017, to raise funds for the 2018 Festival. 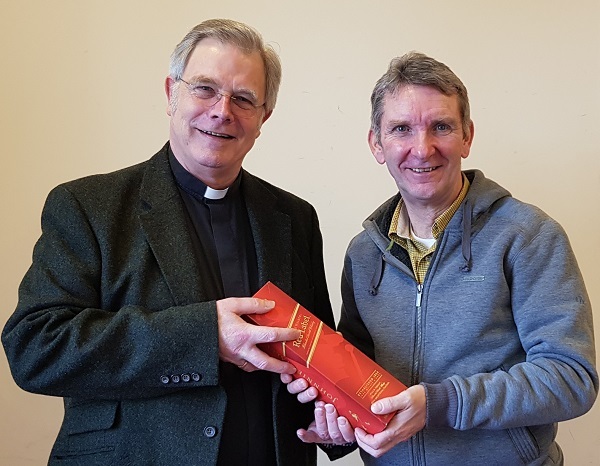 Mick also opened a sweepstake to win a bottle of whisky if anybody could estimate the total number of miles he would walk, and having complete his epic journey of 1355 miles, W.Bro Stephen Roberts came nearest with an estimate of 1342 miles. Rt W Bro Trevor Walker was on hand to present the bottle of Johnny Walker Red Label to the lucky winner. Congratulations to W Bro Stocker for completing the walk and raising £1122 for the MBF Festival 2018, and to W Bro Roberts for winning the sweepstake. Support W. Brother Arthur Baxter on his Epic Trek! At a young 75 years of age, W. Brother Arthur Baxter is planning a Sponsored Walk for the MBF 2018 Festival and the Matt Hampson Foundation. All Masonic donations will go to the 2018 MBF Festival and any other donations, from rugby clubs etc. will be spilt 50/50 between the MBF 2018 Festival and the Matt Hampson Foundation whose aim is to provide advice, support, relief and/or treatment for anyone suffering serious injury or disability which has arisen from any cause, but in particular from participation in or training for any sport, sporting activity or other form of physical education or recreation. Arthur is receiving great support from the local rugby clubs and also Premiership side Leicester Tigers where Arthur is a regular visitor. Meet and greet Arthur at any of the locations on his itinerary below. Leave Newark at 9 am, to Kesteven RUFC (Grantham), arriving about 4-30 pm. Leave Kesteven at 9am to Melton Mowbray RUFC, arriving about 4pm. Leave Melton Mowbray at 10am to Syston RUFC arriving about 2-30pm. There was an excellent presentation of the Mark Lecture by Junior and Senior Brethren which was well received by all present. Both the Gavel and Sceptre are in the custody of the Mark & RAM lodges in Scunthorpe at the moment this is the first time I think that this is the first time they have been in the same masonic building a unique occasion as the both were the instigated by W.Bro Alan Birkett from the St Oswald's lodge in Scunthorpe. An early 20thC Continental silver Masonic crown wind triangular pocket watchAn early 20thC Continental silver Masonic crown wind triangular pocket watch, the mother of pearl dial decorated with various symbols, the case with similar decoration, sold with a silver watch chain and Masonic related fob, stamped Mexico 950. Raised £850 at auction. A tremendous sum towards the festival. 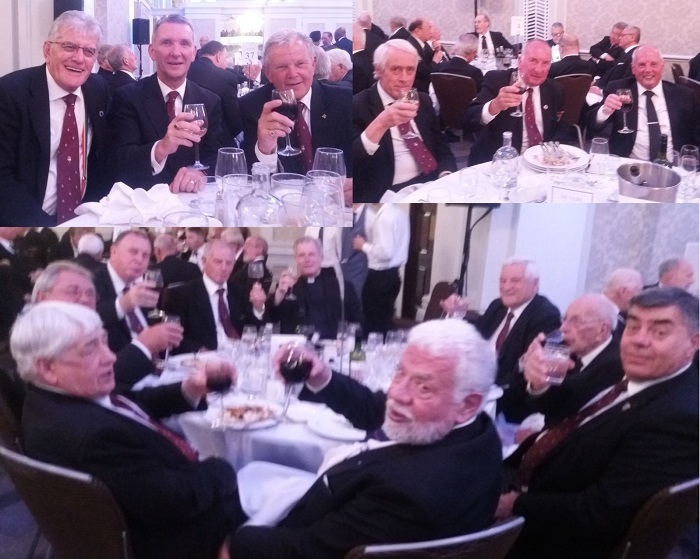 Steve Roberts celebrating at Connaught Rooms with some of the lads after receiving Royal Ark Mariner Grand Rank at the Annual Assembly. I just wanted to say how much the Mobile Chemotherapy Unit is appreciated, and to thank you all. The service it gives is 'second to none' for local people. The Sister always has everything very well organised, and takes pride in caring for all patients' needs, both physically and emotionally. A Staff nurse works with her using the same expertise and kindness. The two drivers (they take it in turns) Stephen and David are both helpful in the vehicle, as well as driving to Louth etc. There are now 12 mobile units in operation and they have saved the patients 2.000.000 miles of travel and 170.000 hours of time. 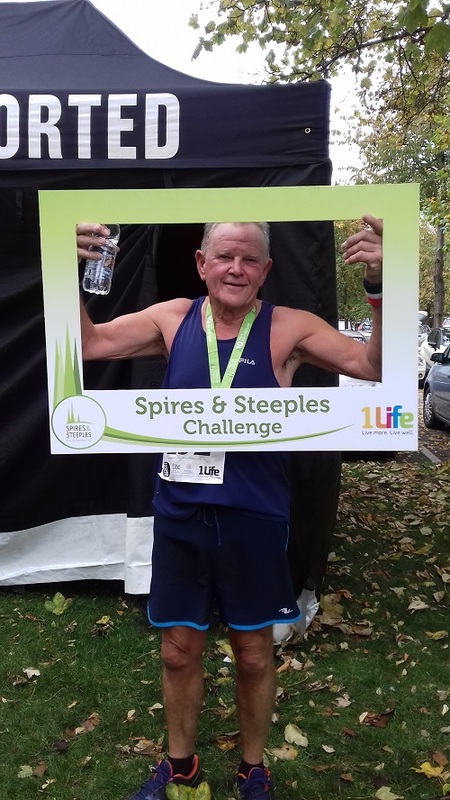 WBro Geoff Burgoin St Guthlac ran the Spires and Steeples 1/2 marathon cross country challenge in October for the Festival. He Thanks all those who sponsored him. First Prize, £300.00 W. Bro. R. Hansard, Whitestone 1203. We have forwarded a cheque for £4,060.00 to the Festival making a total so far of £42,360 donated from the Draw. £9,610.00 in total has been paid out in prize money so far. Many thanks to all of you who are participating in the Draw we are very happy, as we are sure that you are, in the money raised so far. I would walk 1000 miles. 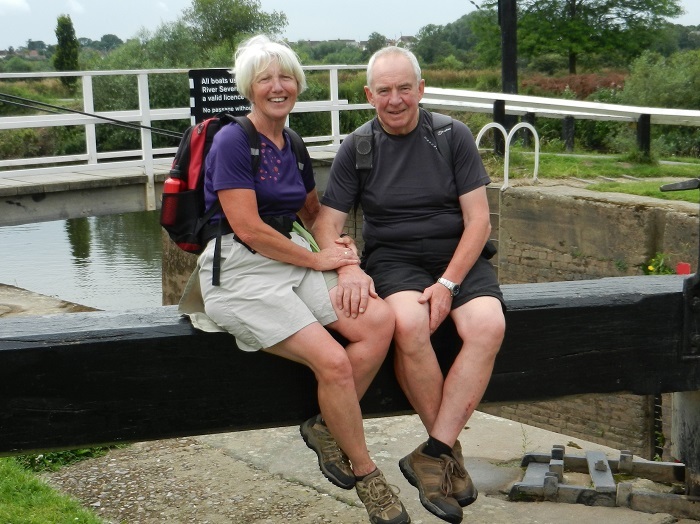 On 13th September 2017, he walked the thousandth mile of his challenge with his wife Sandra at Barkston near Grantham. Sandra also completed the 1000 miles. During the year so far they have walked in Grand Canaria, India, Bulgaria and Slovenia outside the UK, whilst not only walking in Lincolnshire they have done walks in Nottinghamshire, Cornwall, Norfolk, Lancashire, Yorkshire and Cumbria. The 250th mile was walked on 26th February at Scopwick, the 500th mile was reached on 24th May at Biscathorpe in the Wolds, and the 750th at Gainsborough on 27th July. A highlight was the 650th mile at Osojnica Mala, in the Slovenian Alps on 6th July. The walking goes on and sponsorship is still open as the person predicting the final mileage on 31st December will win a bottle of whiskey. So far £1087 has been raised for the Festival. By now you all will be well aware of the forthcoming event at The Epic Centre, Lincolnshire Showground next July. These events take a great deal of preparation and as the Provincial GDC I am tasked with ’stewarding’ the event, accordingly I am looking for volunteers to assist me. The festivities start with a day trip to East Kirkby for the Aviation Heritage Tour on Saturday 7th July and our Festival Banquet being held at The Epic Centre, Lincolnshire Showground that evening. • Greeting our guests with welcome packs at their hotels, which will be The Double Tree by Hilton, and the Holiday Inn which are both situated next to one another on Brayford Wharf. The Lincoln Hotel, Eastgate, the Holiday Inn Express, Brayford Park and The Bentley Hotel, South Hykeham and generally assisting with any queries that they may have. • Helping our guests with their coach travel on the Aviation Heritage Tour on Saturday 7th July, and more importantly, ensuring they return from the tour on time! • Marshalling guests onto their coaches for the short journey to The Epic Centre on the Saturday evening. • A team of Stewards will be required at The Epic Centre to ensure the whole evening runs smoothly including car parking duties. For those who are able to assist at The Epic Centre and are not booked in to dine, a small buffet will be provided. 4. Are you available to assist with greeting guests at one of the hotels on Friday 6th or Saturday 7th ? 5. Will you be able to act as a ‘coach steward’ for the Aviation Heritage Tour on Saturday morning? 6. 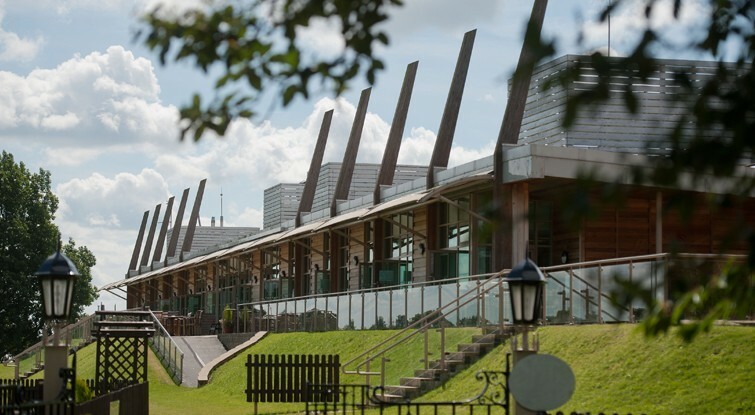 Are you able to act as a Steward at The Epic Centre on the evening of 7th July? If you would like any further information or wish to discuss anything connected with stewarding at our forthcoming Festival Weekend, please do not hesitate to contact me. Thank you for your anticipated support and I look forward to hearing from you. On Sunday last (9th. 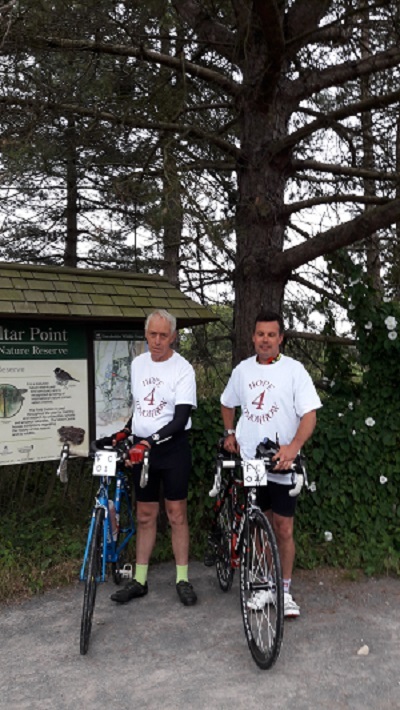 July) I took part in the Sponsored Bike Ride in aid of the Mark Benevolent Fund including the “Hope for Tomorrow” campaign to raise funds for mobile chemotherapy units. I was accompanied for the whole route by Brother John Priestley a member of Bayons Craft Lodge and hopefully a future candidate for Mark. The total distance we rode was just over 80 miles. We were joined at the viewing spot on the Bluestone Heath Road by W. Bro. Bob Marwaha who rode with us until we joined the Caistor High Street. From the Lodge in Market Rasen we were joined by Bro. Trevor Quincey who then cycled with us to the finish on the Trent side at East Ferry. The day was nearly ideal with no significant wind and it remained dry but was perhaps on the hot side by the time we reached the finish. The two of us set off at 8.10 am from Gibraltar Point Nature Reserve symbolically as Fellow Crafts (see our bike numbers) having perhaps discovered the hidden mysteries of nature and science. We had to cycle into Skegness and out again as my original planned route proved to be a “No Through Road.” We went through Croft and then keeping wherever possible on back roads made our way to the outskirts of Alford and on to the entrance of a quarry at South Thorseby where we stopped briefly and changed our bike numbers to represent workmen from the quarries. Onwards and upwards to the top of Lincolnshire Wolds, down to Donnington on Bain and up again to the Caistor High Street before making our way to the Lodge in Market Rasen and a welcome break and some of Janice’s sandwiches! For the final leg of our ride we changed our bike numbers again to represent Mark Master Masons on our continuing journey in Freemasonry. Whilst this last part of the ride was relatively flat it was getting pretty warm and there was slightly more wind. We were quite relieved when we got to the shade of Laughton Woods and the final short run to the Trent side. I must say a very big Thank You to W. Bro. David Pattison who took us and the bikes to the start, followed us on the ride providing much needed food and drink and then took us and our bikes home from the finish. The ride could not have taken place David without your support! Also many thanks to John Priestley, Bob Marwaha, and Trevor Quincey for riding with me and to Janice Donovan are renowned chef for providing the sandwiches etc. at the Lodge. I must also express my thanks to those who turned up at Lodge to welcome us and encourage us on our onward ride. Now for the sting in the tail! Please can I ask for sponsorship from any Mark and RAM Bayons members who have not already sponsored the ride. The cause is very worthwhile and it will of course count towards the 2018 Festival. I have raised just over £500 so far but it would be good if we could increase this substantially. As Charity Steward in Mark I have plenty of gift aid envelopes so that tax payers can tick the box and we will then get a donation from the government! For those that have already donated, I will find out how we can claim “gift aid” on those donations. Finally I attach photos of John and myself setting off, at the Quarry entrance and of the three of us (including Trevor) at the Lodge and at the finish. Brethren all, after a successful Berkshire Festival, it's that time !!! Please find link below to the booking pack for the 2018 MBF Festival (PDF format) which we as a Province are hosting - It is the 150th anniversary of the MBF which culminates in our celebration dinner at the Epic Centre, Lincolnshire Showground on the 7th July 2018. We are expecting a high attendance and it is particularly hoped that the brethren of Lincolnshire will attend in good numbers to support both the Festival and our R W Provincial Grand Master who is presiding over the event. Although it seems a long way ahead, it would obviously be helpful if you could book as early as possible to assist with the planning and arrangements. We have 801 Mark Masons in our Province and it would be nice to see as many as possible attending the evening and perhaps even volunteering to assist in some way. Here's to a great year and a fitting finale dinner next year. He kindly undertook such a voyage for the last Craft Festival in 2014 and clearly didn’t wear himself out - he’s looking at riding around 77 miles this time !! The ride will take place on Sunday 9th July starting from Gibraltar Point Nature Reserve at around 8 am. The proposed route takes him onto the Bluestone Heath Road north west of Alford, on to the Lodge at Market Rasen for around 12 noon then the final leg to the Trent side at East Ferry. Total distance is about 77 miles. W. Bro David Pattison has kindly offered to drive a support vehicle and we will hopefully have a mobile feed station at or around the viewing site on the Bluestone Heath Road. The second and main feed station will be at the Lodge where it is hoped there will be a good turnout of support! (We’ll try and gauge an ETA when it’s nearer the time). Edward is calling the ride “A JOURNEY THROUGH LINCOLNSHIRE AND A JOURNEY THROUGH MARK MASONRY” and he’s hoping to discretely pick up on some of the symbolism of the Mark Degree on route. Others including Brothers Jon Moon and Trevor Quincey are joining him en-route, it remains to be seen if they go all the way. Naturally if any other members or any members of other Lodges would like to join them on the ride they would be most welcome. Please contact Edward directly to make the necessary arrangements, (his email contact is below). The main three riders above will be wearing white T shirts with “HOPE 4 TOMORROW” on the front in maroon so they should be easy to identify as they cycle along, anyone wishing to join them and wanting a T Shirt please contact Edward asap. Also further help / support on the route would be welcome especially organising snacks at the Lodge which will be the main feed station. Hopefully appropriate photos will be taken along the route which could then go on the website once vetted! (a route map will be available shortly if anyone wants a more detailed view of the route). Please support Edward and Co in their endeavours, if you would like to sponsor them please pledge your donation by email to either Edward or myself (address below) and then make your donation (preferably in the usual GAE's) to me by post (cheques only, no cash by post please) or in person. My postal address is 35 Dovecote, Middle Rasen LN8 3UD; cheques payable to 'Bayons Lodge of RAM'. (I can supply the banking co-ordinates for online payments if preferred) We’ll then issue a cheque from the 1365 Lodges and send the GAE certificates to the PrGrand Charity Steward in the normal way. Tony Bennett at the Albert Hall on Tuesday the 27th June. A member of St Guthlac Mark Lodge No.1122 is hospitalised for the next three weeks. He has four tickets (Value £300.00) for the Tony Bennett concert at the Royal Albert Hall 8pm start on Tuesday 27th June 2017, which he is not now able to use and he is willing to donate them to the highest bidder. Tony Bennett is a world-wide star who does not perform many concerts these days.... this is an opportunity for tickets which are extremely sought after...and rare! 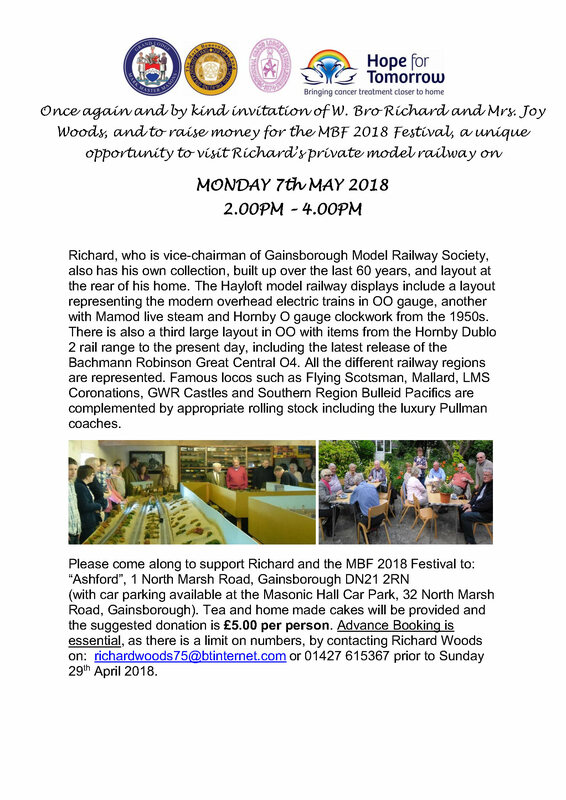 The Brother is unfortunately unable to attend the event and has very kindly donated them and the resultant proceeds to the 2018 MBF Festival. Can I therefore invite all brethren of the Province who might wish to go to the event to bid for the tickets. BIDS ARE FOR THE 4 TICKETS TOGETHER AS A PACKAGE AND ARE FOR THE TICKETS ONLY - TRAVEL IS NOT INCLUDED AND SHOULD BE RECEIVED BY MYSELF BY E MAIL BEFORE 6 PM ON FRIDAY 23rd JUNE. This will enable the travel arrangements to be made by the winner and also for the tickets to be collected and delivered. Over 50 brethren from our Province attended the Mark Grand Investiture. Many attended the meal afterwards and are pictured below. Nearly 30 brethren travelled down on the bus arranged each year by W.Bro Ray Wade and enjoyed a stop for a meal on the way back. If you have never been to this meeting before, please do try to go next year, when W.Bro Ray will no doubt be arranging another 'Grand Day Out'. 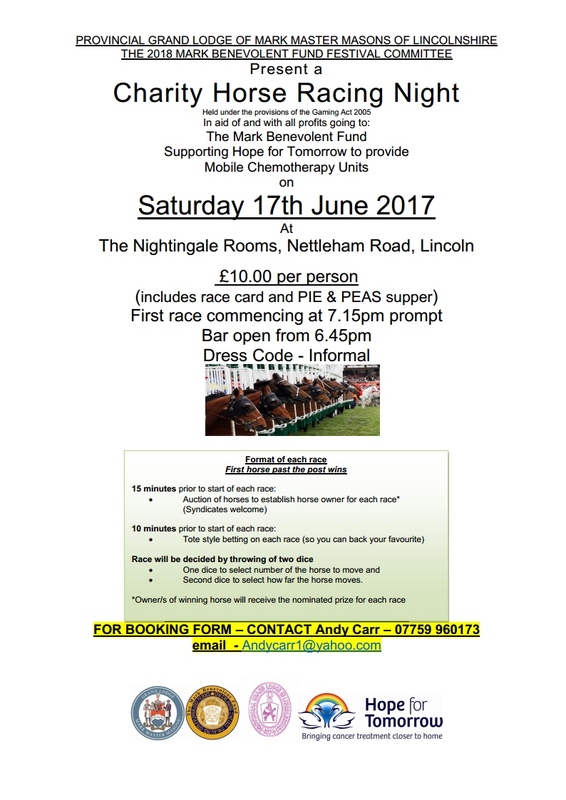 The launch of the Lincolnshire 2018 will take place on the 8th July 2017 following the completion of the Berkshire 2017 Festival, culminating in our celebration dinner at the Lincolnshire Showground on the 7th July 2018. It has been the practise of some Charity Stewards to delay any donations received at Lodge meetings and from individuals being forwarded on a quarterly/half yearly and in some cases on an annual basis. As we near the launch, it is requested that all charity donations for the 2018 festival be forwarded to our Provincial Charity Steward as soon as possible so that they may be accounted for and forwarded to Mark Masons' Hall, enabling them to be verified and recorded in a timely manner. Any delays may result in such donations not being so recorded which is the last scenario we would wish for. The mobile chemotherapy unit celebrated its 3rd anniversary on the 16th of May 2017 in Louth. The day went really well and got good press coverage and lots of local interest,the unit has now been fitted with new smaller seats for easier working conditions for the nurses and more comfortable for the patients. All the feedback from the nurses and the patients was very positive and the unit is being used to its full potential. took part in the MBF 2017 Charity Walk on Saturday May 6th. Your Lincolnshire contribution is £12,506 which is absolutely amazing, I am astounded at your generosity and thank you most sincerely. I know when speaking to brethren, as I travel around that some of you still intend to give to this event, which will further increase the amount raised. Considering that the event may initially have been cancelled due to lack of support makes it even more worthwhile, to make a donation before the closing date of 31st May 2017. As our Pro. 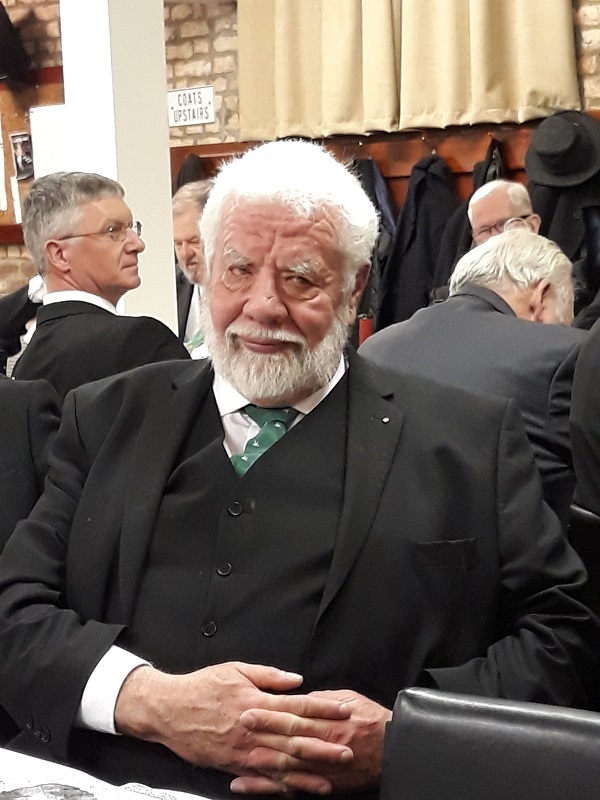 Grand Master, Richard Victor Wallis stands down on June 13th, let's send him off on a high, with a really magnificent total raised for this MBF Charity. 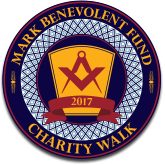 You are all very aware the Lincolnshire Province is currently ‘in Festival’ for the Mark Benevolent Fund. Our Festival will culminate in a Festival banquet to be held at the Lincolnshire Showground on Saturday 7th July 2018 where the grand total of monies raised will be announced. So far, the combined efforts of many Lincolnshire Mark Masons and Royal Ark Mariners have been an outstanding success and I would like to thank everyone for the wonderful support to date. More importantly, the start of the final year of fundraising is almost here so please can I ask every Mark Mason and Royal Ark Mariner in the Province of Lincolnshire to support the Festival in every way possible. 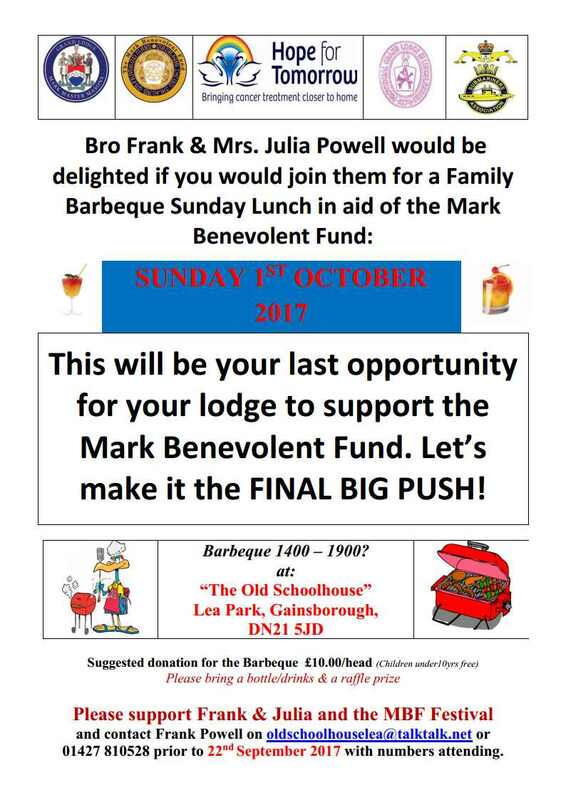 This may be by taking out a couple of shares in the Mark Draw; taking out a Standing Order for regular giving over the next year or by continuing to donate through the charity collection envelopes at the Lodge meetings. It may be through Lodge raffles, or by supporting the many events that are being organised in the next 12 months. If you wish to arrange an event to raise money for the Festival then please do so; the ones that have been held so far have been a tremendous success and there is no monopoly on good ideas – if you think it will work then it probably will! 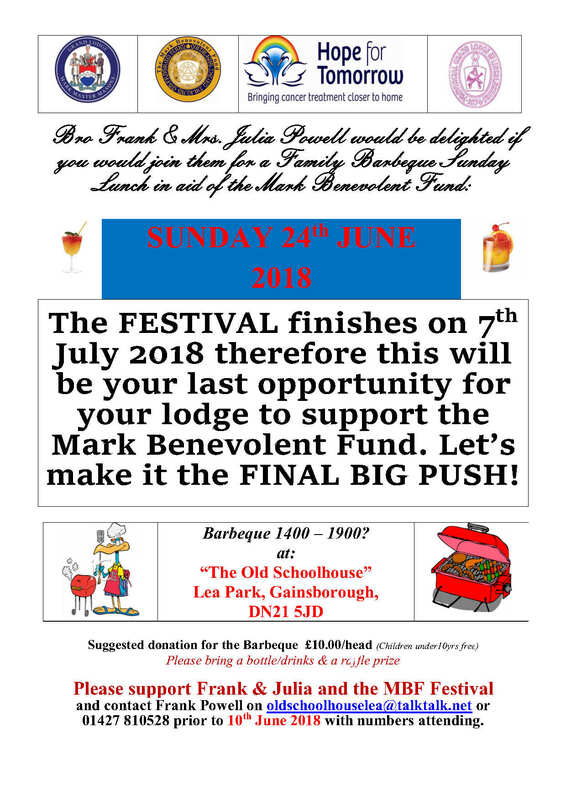 Please let’s have one, big final push as the 2018 Festival enters the final year and support your Lodge; the Province of Lincolnshire and the Mark Benevolent Fund to make their 150th Festival a resounding success. The Pro Grand Master was in attendance at their first Provincial meeting. 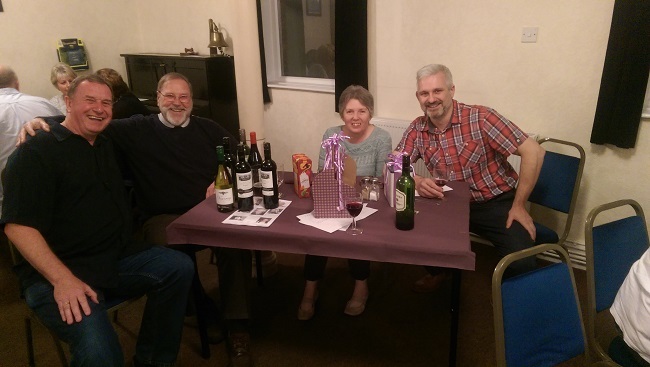 A quiz night on 12th May was staged by Bayons Lodge of Royal Ark Mariners (1365). Jeff Stephenson as the Worshipful Commander organised it, in round figures the attendance was 50 made up of members and their guests. The Lodge’s caterer Mrs Donovan cooked the meal providing her services for free for the Festival; the evening with the raffle proceeds made £485.50 for the 2018 Festival. The questions were taxing but based on absolute trivia, congratulations to the ‘White & Stoned’ team from Lincoln who won the quiz and showed that they were far more trivially minded than anyone else on the night! Download form can be download HERE. 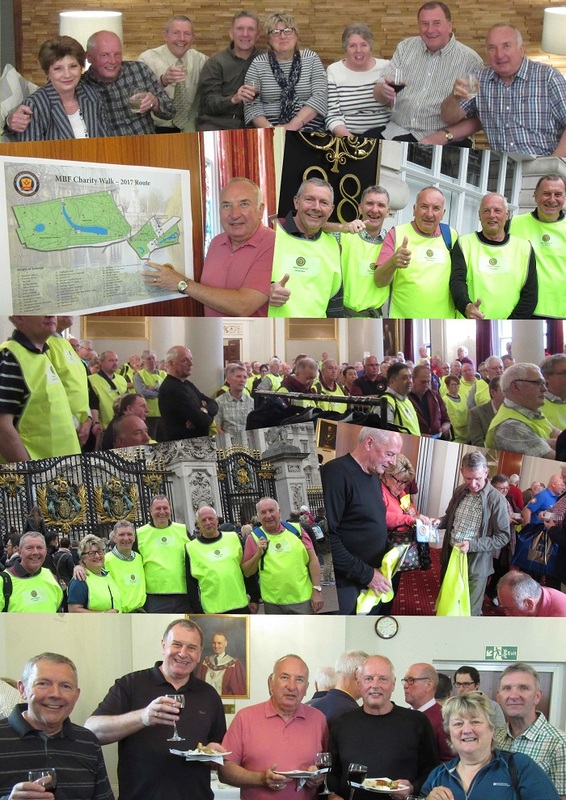 The Lincolnshire Province Team of Walkers, W. Bros Ron Harrison, Phil Anyan, Dave Wheeler, Steve Roberts and Bruce Goodman successfully completed the Mark Benevolent Fund Charity Walk. 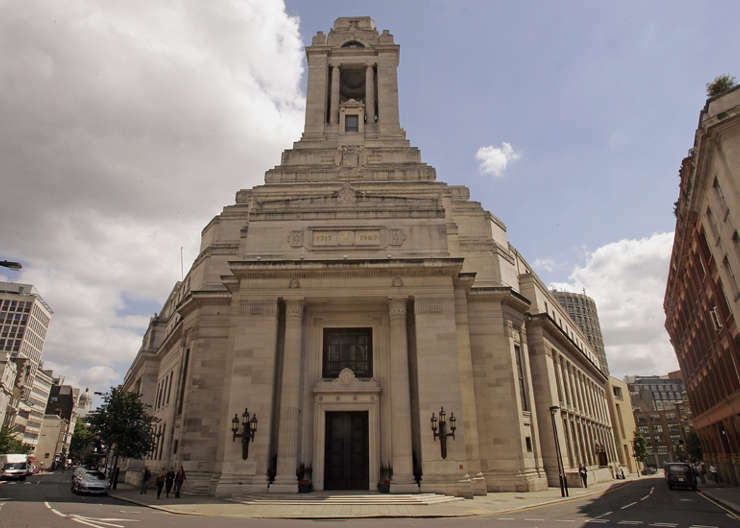 The walk was over a course starting at Mark Masons Hall around St James’s Park, Green Park, Hyde Park and Kensington Gardens returning to Mark Masons Hall. 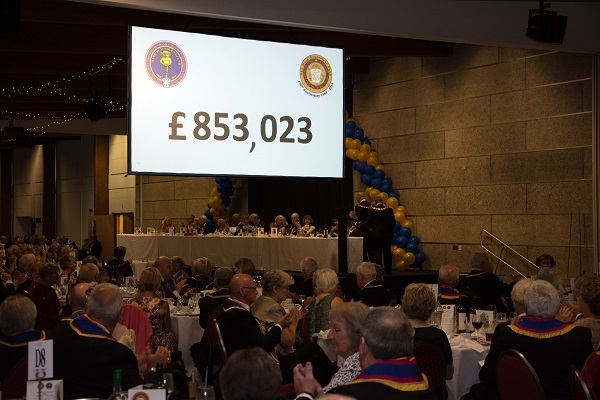 Currently the Provinces taking part have raised over £324,000 for the Mark Benevolent Fund with Lincolnshire total at £6,819 and monies still coming in. The pictures show the Team in Training, preparing at Mark Masons Hall and the briefing, during the walk at Buckingham Palace and the Albert Memorial followed lastly by cooling down light training. 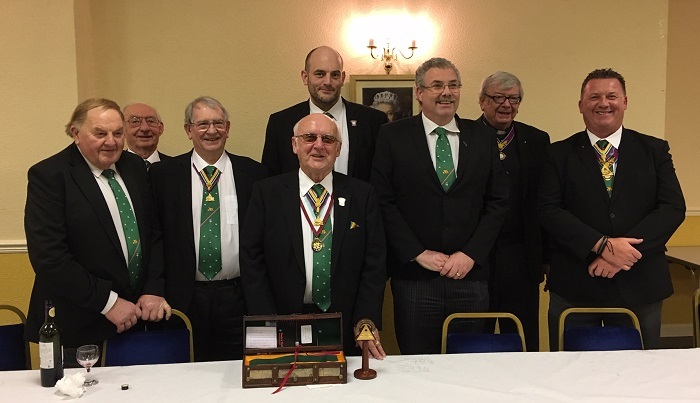 On Monday following the Provincial annual meeting at Lincoln, the attendance at St Guthlac Lodge of MMM was swelled to a total of just over 50 with visitors coming to claim the travelling gavel. It was successfully claimed by St Wulfram's Lodge of MMM with 29 x 10 brethren = 290 member miles beating off the challenge from St Botolph's Lodge of MMM with 27 x 7 = 189 member miles. The next meeting of the St Wulfram's Lodge is on 26th October 2017......get your troops gathered to attend and make claim to that wonderful travelling gavel! Another excellent day was enjoyed by a record number of Lincolnshire Mark Brethren and visitors to the Provincial Grand Lodge meeting for 2017 on SATURDAY 25th MARCH 2017 at the Epic Centre, Lincolnshire Showground, Lincoln. Congratulations to our new Deputy PGM, W.Bro. Neville Storey, our new Assistant PGM, W.Bro Ron Harrison, and all the brethren who received promotions at this meeting. Rt W Bro Rev Trevor Walker looks forward to welcoming you all to next year's meeting. Address to the Brethren at Provincial Grand Lodge, 25th March 2017, by Rt W Bro Rev Trevor Walker. 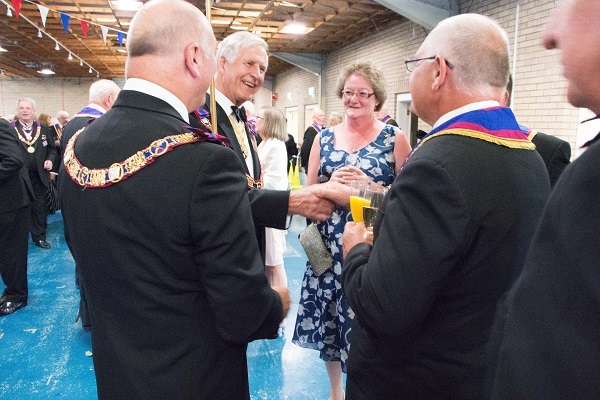 A most important business in all our Masonic Meetings is to welcome our guests. It is a tradition in other constitutions for guests to be formally introduced and presented to the Master after the lodge is opened. I am delighted that after our opening I was able to welcome so many guests to Lincolnshire. On behalf of the entire Province I welcome you again and trust you will have a happy day in Lincoln, a safe journey home, and a speedy return to join us again. I likewise extend the warmest welcome to the heads of other orders that meet in Lincolnshire. This is the 143rd. Meeting of the Provincial Grand Lodge of Mark Master Masons of Lincolnshire and the third time we have met at the Epic Centre. The numbers attending and dining indicate this venue meets with your approval and so I welcome all the Lincolnshire brethren. It is very much your meeting and your Provincial Grand Lodge. I congratulate those I have appointed and invested to Provincial Grand Rank. Thank you for taking office and accepting all the responsibilities that go with the honour. I know you will work tirelessly for our lovely degree and I especially congratulate those appointed to Provincial Grand Rank for the first time. Honours are a reward for past service but also given in anticipation of future service. Thank you for what you will be doing! I mention past service. I sincerely thank those who are stepping down from active office today. Change is inevitable and I have to admit change is something I dislike – but must happen. I thank those who now have stood aside to allow others the opportunity of serving in their place. I am sure they will support and advise their successors and will continue to serve the Province. Holders of past active rank are a great wealth in our Province and I thank them for allowing others to gain the same knowledge and expertise, which will assist us all in our work. Change is also taking place at Grand Lodge. At the meeting of Grand Lodge on 7th. March M.Wor. Bro. Richard Wallis Pro Grand Master announced he would be retiring. He has led Mark Masonry in a most expert manner and I know we shall miss him. However I am pleased to tell you it is his intention to be present at the 2018 MBF Festival. The new Pro Grand Master will be the Deputy Grand Master R. Wor. Bro. Ray Smith, the new Deputy Grand Master will be the Assistant Grand Master R. Wor. Bro. John Prizeman and I am delighted that the Provincial Grand Master for Leicestershire and Rutland R. Wor. Bro. Stephen Davison who is present with us, is to be Assistant Grand Master. A new Grand Secretary and Grand Director of Ceremonies will also be appointed and invested. Last year many brethren from Lincolnshire travelled to Grand Lodge in London to witness the Grand Master appoint W. Bro. Dennis Berry Assistant Grand Inner Guard, W. Bro. Philip Anyan Grand Steward, W. Bro. 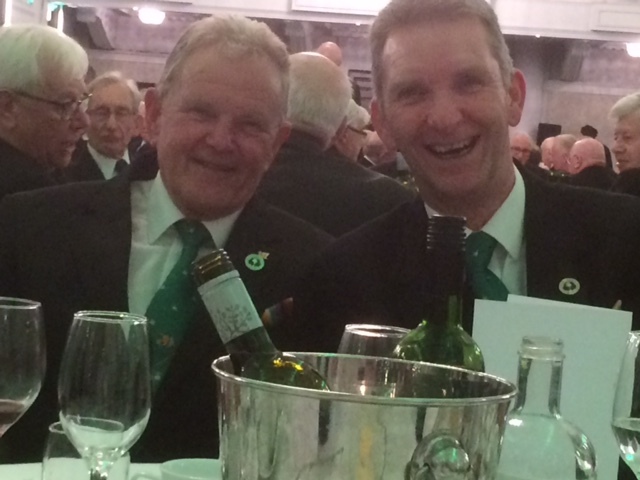 Geoffrey Burgoin Past Assistant Grand Director of Ceremonies , and W. Bro. David Gentle Past Assistant Grand Sword Bearer. The Grand Master promoted W. Bro. 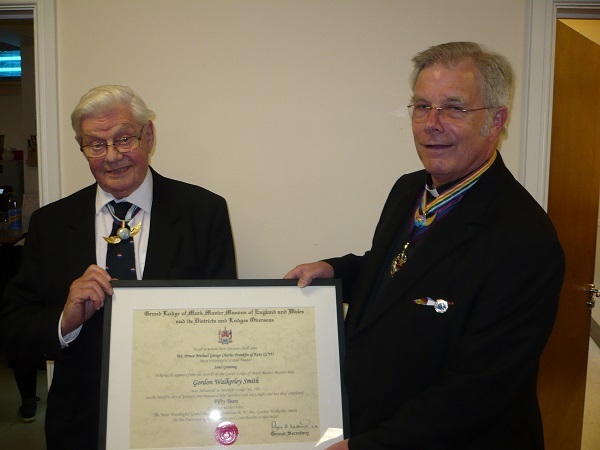 Tony Greswell to Past Grand Senior Deacon, W. Bro. Bob Paterson to Past Grand Junior Deacon, W. Bro. John Winter to Past Grand Junior Deacon and W. Bro. Ron Harrison to Past Grand Junior Deacon. W. Bro. Ray Wade will again arrange the coach trip to Grand Lodge. You will need to book early brethren as this Grand Lodge Meeting will be very heavily subscribed. There is to be the traditional celebratory dinner at Baldock for those travelling on the coach. If you have never attended Grand Lodge, then I do urge you to do so. It is always a most splendid occasion and you will be supporting your brethren from Lincolnshire receiving Grand Rank. The meeting is open to all Mark Master Masons and you can either travel on the coach and dine at Baldock, or join me and other brethren at the Connaught Rooms. Whichever you choose we guarantee a most enjoyable day. I have referred to our visitors and visiting. Visiting is at the heart of freemasonry and I thank all those involved in Provincial visiting. I am grateful to the Provincial Wardens W. Bro. Trevor Knight and W. Bro. Mick Stocker for visiting every Mark and Royal Ark Mariner Lodge in the Province. I thank my Deputy and Assistant Provincial Grand Masters, and the Grand Lodge Officers who represent me at Installation Meetings. I thank the Provincial Team who have joined with me on five official visits. These have been uplifting events with nearly a one hundred percent attendance of Provincial officers. I thank those who have accompanied me when visiting other Provinces and when going to London for Grand Lodge. Without exception these have been enjoyable, happy occasions with new friendships made and old ones renewed. All these visits are times when we experience the happiness of Mark Masonry. The warmth and hospitality of the welcome we receive when visiting other Provinces I hope is reflected in the welcome we endeavour to extend to our visitors today. I thank all the lodges of the Province for the generosity of their welcome to me, my representatives, and the Provincial Team when we visit them. Sharing with others is at the heart of masonry. To encourage visiting between our lodges the Travelling Gavel has been chased all over the Province. 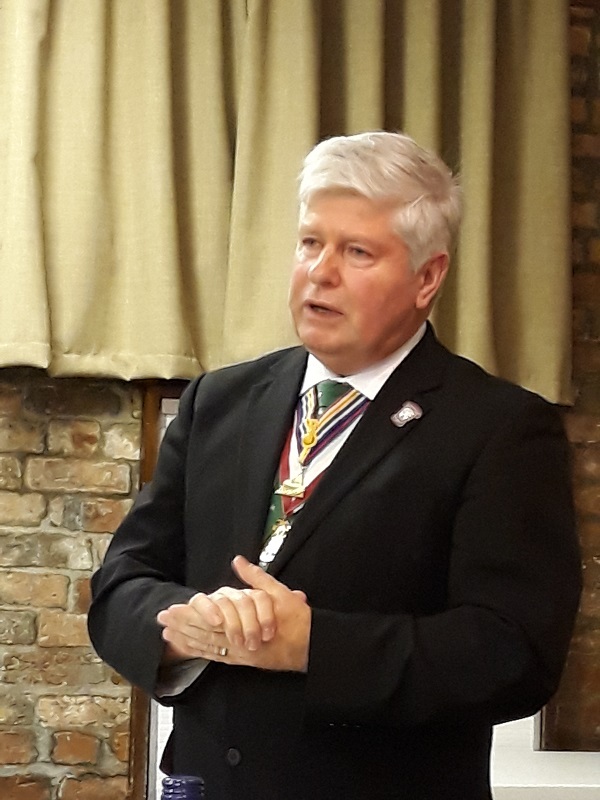 The Past Assistant Grand Master produced some statistics to show that since the last Provincial Grand Lodge the gavel has travelled from Gainsborough, to Alford, to Boston, to Grantham, to Market Deeping. A total of 134 miles. In May 2015 it was held at St. Swithuns in Crowle – the most northerly part of the Province, and now is held in St. Guthlac Lodge Market Deeping. The most southerly part of the Province. The lodges holding the gavel often have attendances of over sixty or seventy brethren when a raid to claim the gavel is undertaken. The concept of sharing with others is evidenced by our concern for charity. 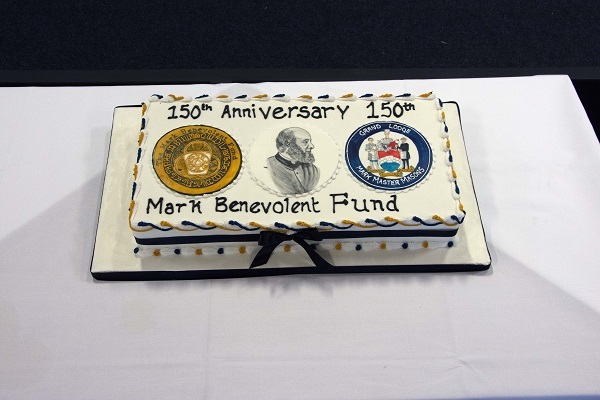 On 16 April 1868 the Mark Benevolent Fund was established at a meeting of Grand Mark Lodge held at Hull. The fund has continued to support needy Mark Masons and their families since that time. In addition numerous other worthy causes receive financial support. We are well aware of this in Lincolnshire with the Mobile Chemotherapy Unit Elaine being funded by the MBF. We are honoured to be hosting the 2018 MBF Festival here in Lincoln. The 150th. 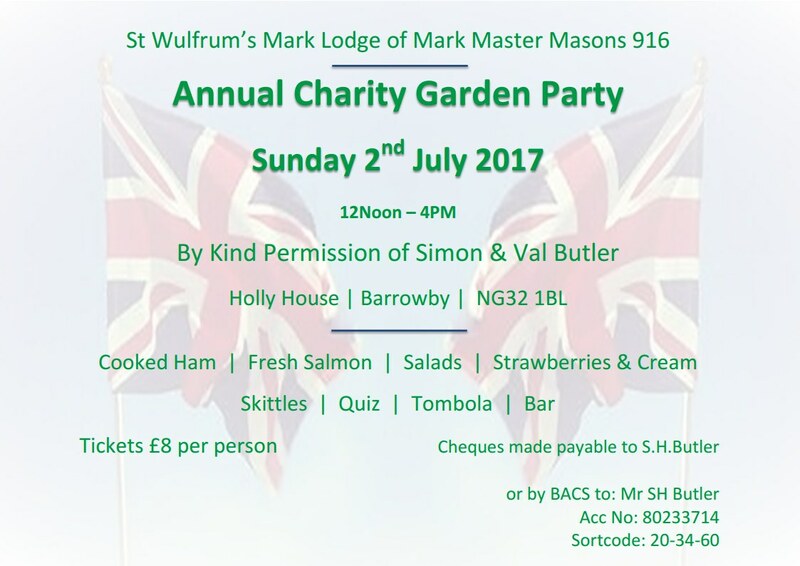 Anniversary of Mark Charity through the Fund. I am indebted to the members of the Festival Committee under the chairmanship of W. Bro. Dave Wheeler for all the planning for next year. I am indebted to all the Lincolnshire brethren for their wonderful support of the festival and all the associated events. Barbecues, bike rides, model railway exhibitions, sponsored walks, quizzes, - the list goes on and on. The Mark Draw has raised thousands of pounds and it is still not too late to join. Have a word with W. Bro. Mike Robinson. Brethren by supporting the festival you are really practising your masonry. Charity. Since the last meeting of Provincial Grand Lodge many brethren and lodges have received honorifics from the MBF. I congratulate Urania Mark Lodge No. 326 for being the first lodge in the Province to achieve Grand Patron Gold Award status. I am pleased to say others very soon matched them. It has been a real joy to present so many jewels to lodges and brethren this past year, but the real joy is your support for the MBF and the 2018 Festival. Please keep up the support for there are now only 468 days to the Festival! We are very fortunate in Lincolnshire to receive the support of the Craft. I have already acknowledged the very generous donation towards the 2018 Festival received from the Craft Provincial Grand Master V. Wor. Bro. Graham Ives. I make no apology for saying thank you again and urge us all to continue this mutual support. It is vital we have a strong Craft for the future of our Mark lodges depends on attracting members from our Craft lodges. I encourage you to be active in your Craft Lodges and encourage the right men to take that next step into the Mark degree. Meetings such as this require much work. The brethren of the Sutcliffe Lodge No. 188 and the brethren of the Lincoln Lodges have undertaken the local arrangements by preparing the lodge room, transporting furniture and all the preparations of these last few days. I thank W. Bro. Malcolm Forrest our Provincial Organist, not just for the wonderful music, but also for getting the organ here. He’s not been in the best of health over the past few months so we are especially delighted to be able to listen to his music again. The Provincial Stewards and Directors of Ceremonies with their team have provided flawless choreography, and the Provincial Grand Secretary and his team have seen to their usual highly efficient arrangements. W. Bro. Craig Maurier the Assistant Provincial Grand Secretary has organised printing and we especially thank him for all his efforts. I especially thank those who will man the bar! W. Bro. Provincial Grand Director of Ceremonies. Please conduct the Past Deputy Provincial Grand Master and Past Assistant Provincial Grand Master to me. V. Wor. Bro. John Board and W. Bro. Derek Bontoft. Brethren I now invest you with the collarette and jewel of a Past Deputy and Past Assistant Provincial Grand Master. I wish to thank you for the wonderful support you have given to me not just as Deputy and Assistant Provincial Grand Master but ever since I was appointed Provincial Grand Master. Your advice and guidance has been invaluable and I sincerely thank you for it. I also thank you on behalf of the Province for all your work on our behalf. Again I say this not just as Deputy and Assistant Provincial Grand Masters but also in the former offices you held in the Province and all the extra things you do. For instance the talks you both present in lodges are a wealth of knowledge. I therefore wish to award my certificate of merit to you both as a small token of appreciation and affection from myself and on behalf of the Province. Brethren I am hungry and thirsty, our meal and drink await. Therefore without further ado I thank you for your attention, I wish you a happy Mark masonic year ahead, I look forward to working with you and visiting your lodges. It is a joy to serve as your Provincial Grand Master and may the Great Overseer bless, guard and protect you all. The annual coach trip has been organized for the Grand Mark Annual Investiture on the above date. Each year the Province is well represented at this meeting to support those being promoted or receiving their first appointments. All Mark Master Masons may attend, and those who have never been to Grand Lodge are particularly encouraged to attend this splendid occasion. A full itinerary is below together with costs. The cost depends on numbers travelling on the coach; with a full coach this would be approx. £50; this includes travel, bacon buttie on outward journey and 3 courses evening meal on the return journey but excluding drinks. The Past Deputy Provincial Grand Master will preside at the Festive Board. Please contact W. Bro. R. Wade, PAGDC, RAMGR, if you wish to attend or for further information. 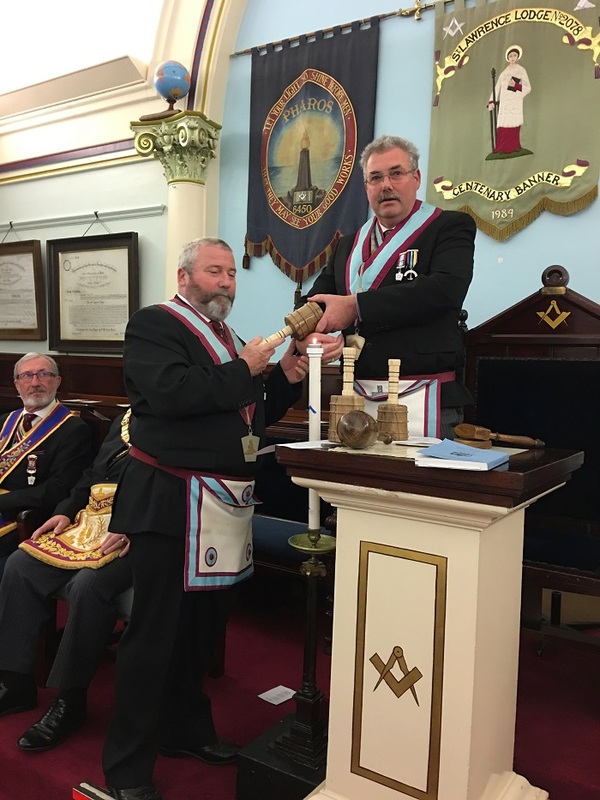 The Worshipful Master of St. Guthlac Lodge of MMM No.1122, Bro David Clark claimed the gavel from the St. Wulframs Lodge of MMM No.916 on Thursday 23rd February 2017. 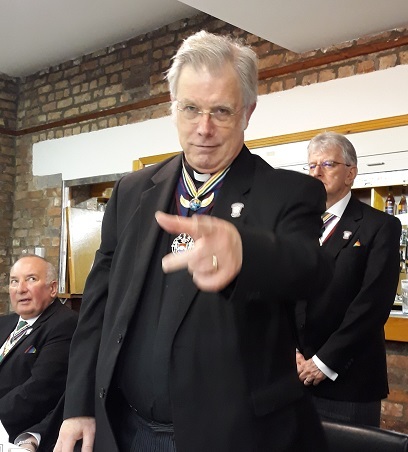 Three Lodges attempted to claim the gavel, with Nene Lodge having 98 member miles (number of members attending x the distance between the two lodge centres), St Botolph's Lodge having 217 member miles and St Guthlac winning the gavel with 406 member miles. St Guthlac's next Mark meeting is on Monday 27th March 2017 .....they welcome brethren wishing to make claim. We are fast approaching the last year of the 2018 Festival and I know many people will want to organise and complete events that attract sponsorship. In addition to the 'My Donate' online facility that can be used, many people prefer to use a paper sponsorship form. Please find below a link to a sponsor form that can be used for any sponsored event for the 2018 Festival, including collecting money for the 2017 MBF Parks Charity walk in which Lincolnshire have entered a team. Please contact me if you have any queries on who to send the completed forms and donations to. With thanks and good luck! Dave Wheeler, Chairman 2018 Festival Committee, email: davewheels@tiscali.co.uk or mobile - 07771 657449. 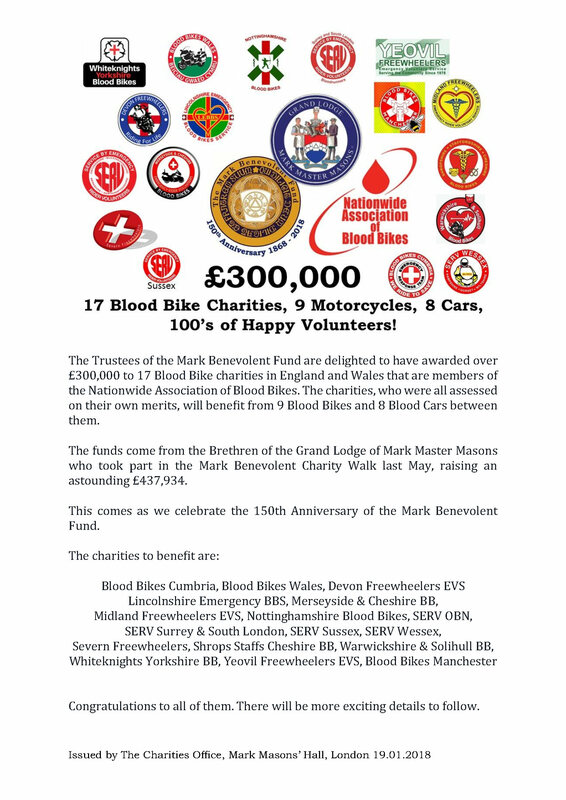 The Mark Benevolent Fund is dedicated to bringing relief and support quickly to Mark Masons, their families, and others who for nearly one hundred and fifty years have received aid from this wonderful charity. Now the Province of Lincolnshire is delighted to show its support by fielding a team to take part in the MBF Charity Walk in London on 6th. May. The walk will follow the Diana Princess ofWales MemorialWalk covering seven miles through four Royal Parks. It is the first time the MBF has organised a national fund raising event of this kind. "I am very grateful toW. Bro. 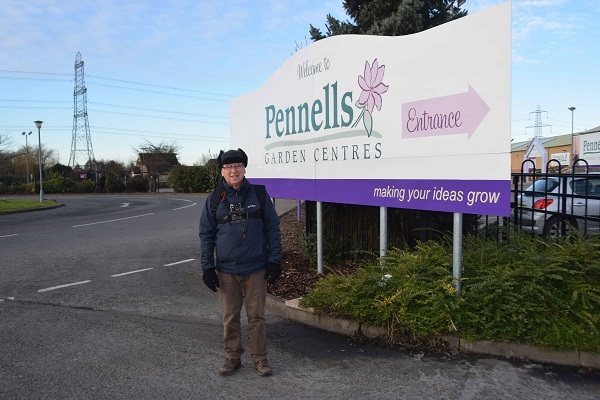 Ron Harrison for agreeing to organise and lead the team of five walkers from Lincolnshire on my behalf. This event provides a wonderful opportunity for us to raise funds for the MBF and so help others. The full details of how to do this are available on the web site. I am certain Lincolnshire will rise to the challenge and you will support this venture by sponsoring theWalk Team and by clicking the “Donate” icon on the web page. Your donation can be credited towards a personal MBF honorific and to our 2018 Lincolnshire Festival. Good luck to the Team!" For those who haven't been to the previous open days, it is well worth a visit and Joy's cakes are to 'die for'! For those who have been before, I'm sure they will want to go again as it is a lovely way to spend a Sunday afternoon. 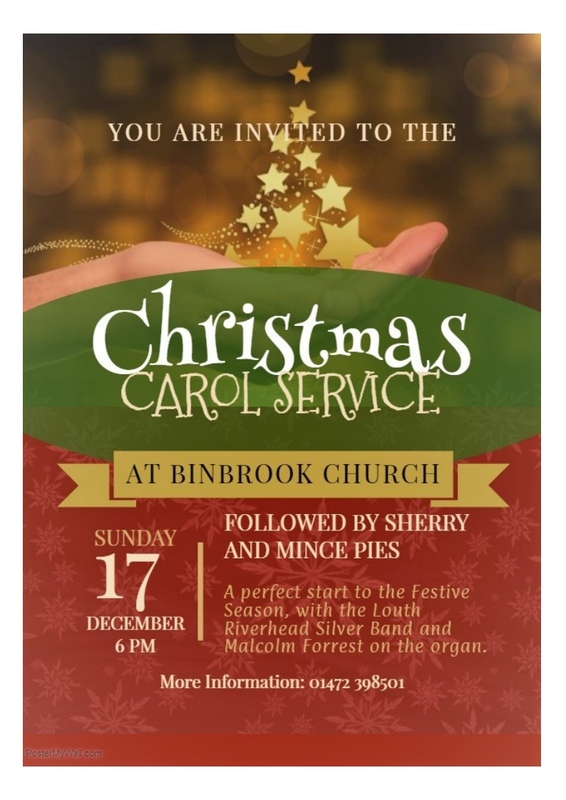 Family and friends are most welcome. Many thanks to all those who bought a quiz sheet and especially those who sent in a completed answer sheet. I hope you all enjoyed the challenge and didn’t lose too many hours sleep….or too much hair! There were 27 entries sent in and just two which were totally correct. The two which submitted perfect answer sheets were Mrs Joy Geelhoed, Boston and Bro Chris Rimmington, Hull. A draw will now take place to determine the winner at the Team visit to Alexandra Lodge of MMM No. 1230 at Long Sutton on 24th January. I will send a copy of the answers (with explanations), together with the answer sheet submitted to everyone who sent in a sheet. Apologies…..But there is another one to be issued soon, which will be distributed to lodges at Provincial Grand Lodge on 25th March… this time with answers of Castles in the British Isles!! Happy searching. The organising committee of The Prize Draw would like to thank all of you who are members of The Draw for your continued support, and those of you who have joined recently for doing so. The Draw is a very satisfactory way of supporting the Festival. Not only does it enable you to partake in the quarterly draws, which we make at various venues in the Province but it also enables you to give Gift Aid, if you qualify. It is, therefore, a win-win method of giving. Since the Draw began in January 2014 our numbers have climbed to 305 and the prizes have also increased from three prizes of £100, £70, and £60 to six prizes of £300, £200, £100, £60, £60, and £60 paying out a total of £7,000 so far. Furthermore they will be increased again, at the next draw in March, to £300, £200, £150, £100, £60, and £60. The more members we have the higher the prize money will be. In the same period we have passed on £30,832 to The Festival. If you do not already have a number, or would like more, there is an application form and standing order on the web site at the bottom of the list under “FORMS”. Why not complete one today and submit it? IF YOU’RE NOT IN IT, YOU WON’T WIN IT!